Win 1 of 3 SERPed Ultimate Accounts Worth $2,148 Each Now! Imagine if you could roll all of your SEO tools into one and save huge amounts of money at the same time! All while saving time, because all your data is under one roof. Well…with SERPed, it is true. 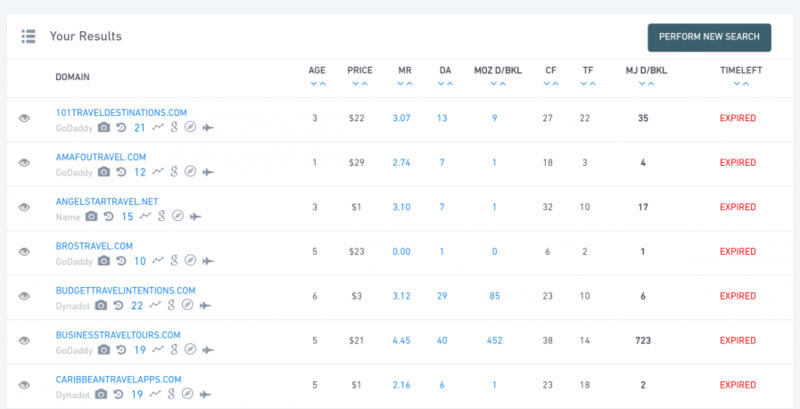 SERPed combines data from Majestic, Ahrefs, Moz, SEMRush & so on at no extra cost, but also features some absolutely jaw dropping custom SEO tools to put that data to use. That would normally cost $447.37 per month but a single account at SERPed gives you all of that & more for less. You can find hot niches. Search for expired domains. Generate thousands of profitable keywords. Steal your competitor’s backlinks. Build custom reports. And, that’s just the top-layer of what you can achieve with this tool. Heck it even has some seriously powerful SEO client acquisition tools that I’m using with my own agency. 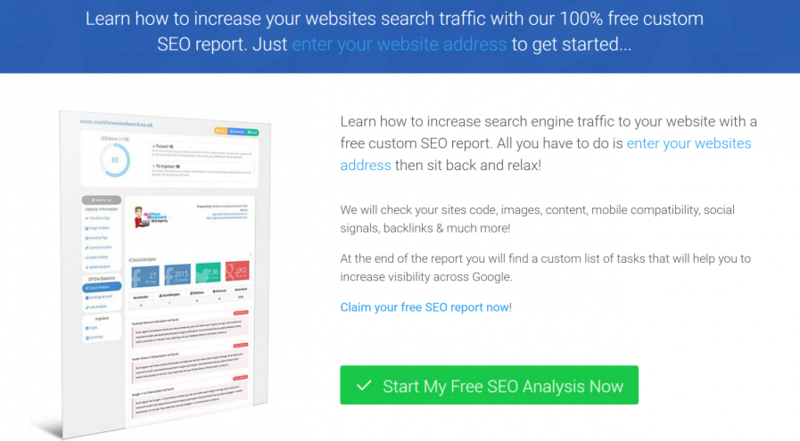 So if you want to supercharge your SEO results – for your clients, or your own site – then this tool is all you’re ever going to need. In this article, you’re going to see not only how to use the tool, but strategies that work to help you use the tool to its full advantage. There are so many features, variations and customizations it’d be impossible for me to talk about all of them in one article. So I’ve focused on what’s going to give you the most value right now. Site Management: How to use SERPed to manage your site, monitor your progress and tweak your site to improve it right now. 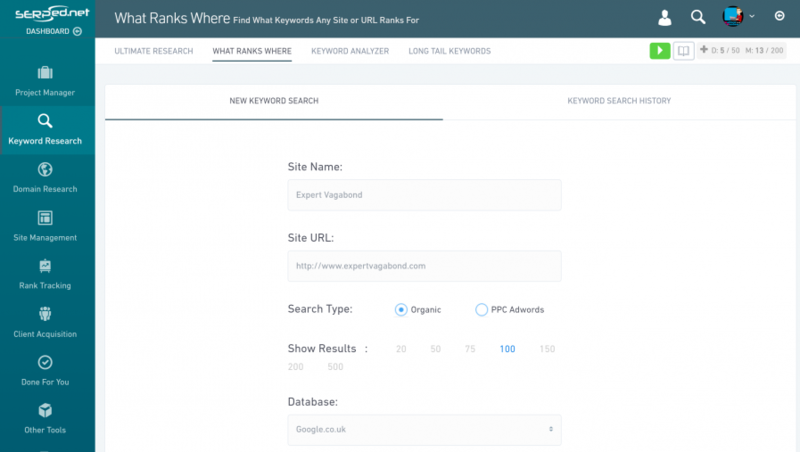 Keyword Research: How to perform next level keyword research and find profitable long-tail keywords you’d never have even thought of. 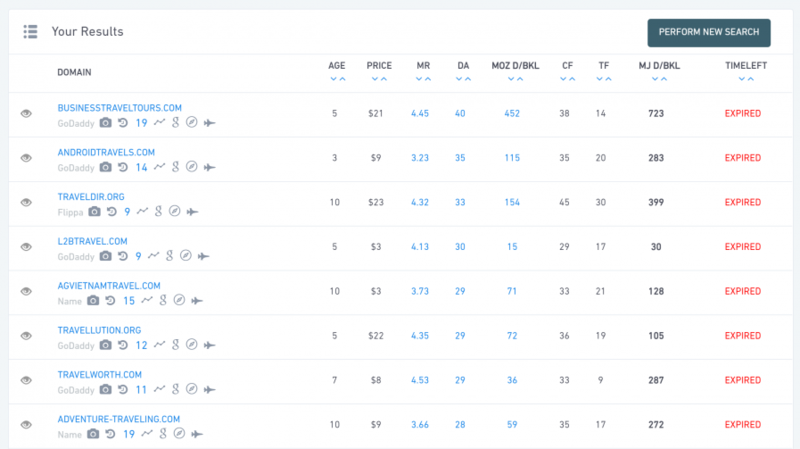 You’ll also see actionable strategies on how to rank for these keywords using the tool. 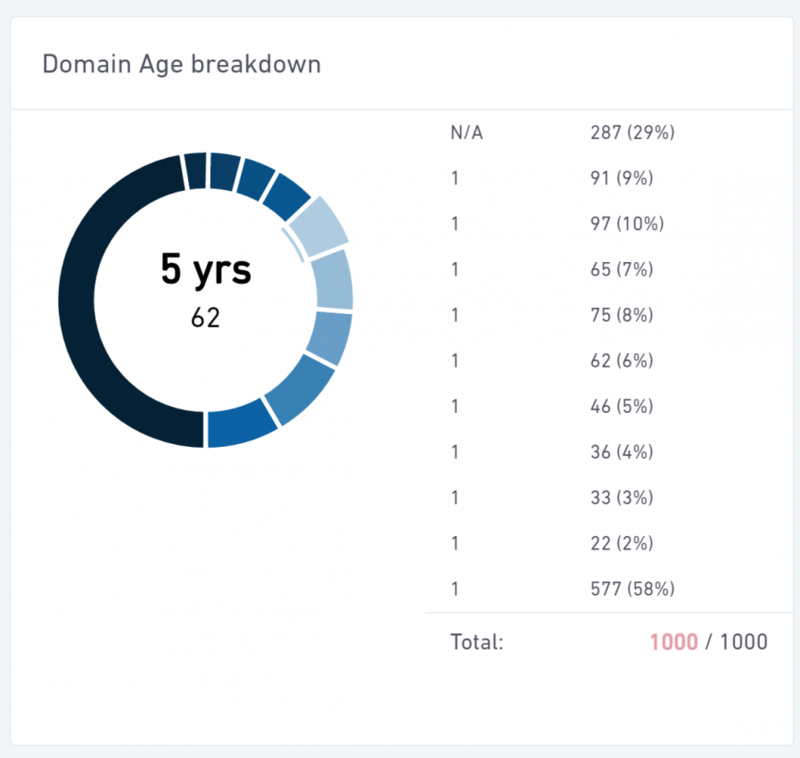 Domain Research: How to 10x your domain research and build a PBN (or empire) that will send your rankings through the roof. This is also where you’ll learn how to run one of the most thorough backlink checks on the internet. 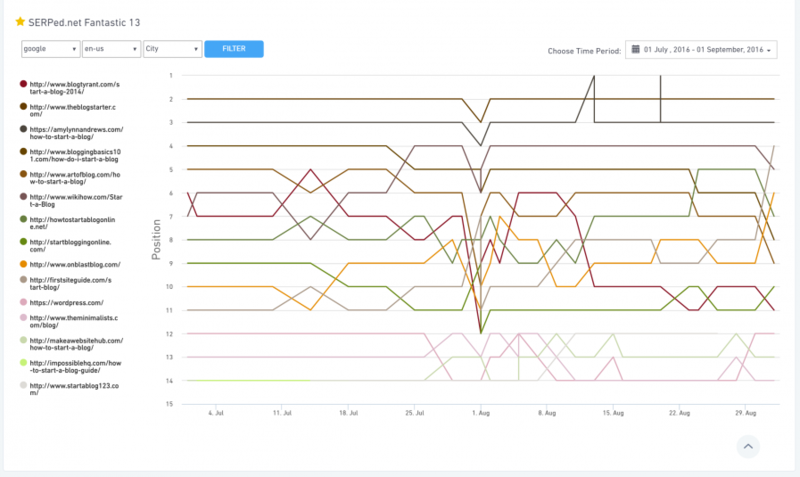 Rank Tracking: Learn how to track your own progress and uncover your competitions strategies to level up your own rankings. Client Acquisition: SERPed comes with a full suite to help you get more clients. Here’s how to use them. Other Awesome Tools: Want free social shares and a hush-hush browser plug-in? They’re here for you. Or, you can carry on to the next section and find out what SERPed is all about. What Is SERPed (And Why Should You Care)? To make SEO simple, accessible and easy to manage. Born from the frustration of wasting time, money and effort of using lots of tools, SERPed was made for SEOs, by SEOs. Every aspect of the tool has been designed by people who have spent years in the trenches and decided they wanted change. In fact, the tool was used for years behind closed doors by a select few industry professionals. It wasn’t until quite recently they decided to share its immense power with others. There isn’t a day-to-day challenge that this tool can’t help you solve. Everything from Keyword Research to building a PBN, backing up your entire site and getting more SEO clients is built in under one roof. And, with its new Version 2.0 launch, it’s just become even more useful. If you believe that getting SEO results doesn’t need to cost you a lot of time, money or wasted mental effort, this is the tool for you. If you are short on time watch this speed review of SERPed that will take you through all of the best features and reveals precisely how much money you can per month by using it. Don’t forget – scroll down to learn 37 awesome ways you can use SERPed to generate traffic & clients. My detailed SERPed tutorial will show you precisely how to increase organic search traffic to your site and generate clients by using the various tools that are included with SERPed. Don’t forget to scroll down and checkout the list of 37 ways to use SERPed below for quick reference. Knowing your site’s baseline is important before you start using any tool. Because once you know where you are – even if it’s absolute ground zero – you can see where you’re going. 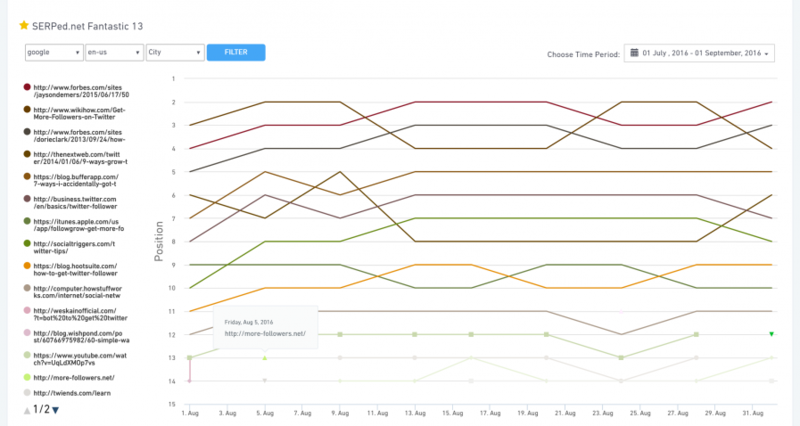 SERPed lets you monitor your entire SEO progress, in real-time, from its dashboard. And you’ll be able to monitor every possible increment from right here. 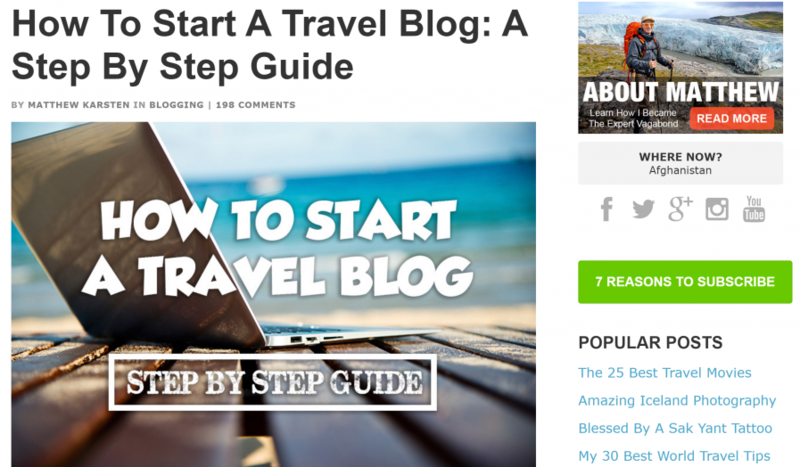 Here you’ll find five steps to follow to get your site all setup. They’re pretty straightforward and don’t take long. If there’s anything you’re unsure of, you can follow along with the tutorials or leave it for later. For example, you’re going to conduct a lot of keyword research in section two, so you can wait until then if you don’t know the keywords for your site yet. The only other stage you may find a little road-block is the Add to Tools section. I’d suggest you just select your countries and take the default settings – unless you have a specific need – so you get coverage across the board. After you enter all your data, it’ll take about 15 minutes to run its analytics. Trust me, its worth the wait. So go & grab a coffee and come back in a minute. Then you can move on. Now your site is set up, you can head to the dashboard to start seeing where your site sits in the world of SEO. That includes the buttons at the top and the coloured icons. Now, I’m not going to cover each of them in this section – you don’t need all of them right now. Here you do a quick check-up on your site and see how your main ranking factors are performing. If there are any glaring issues, or there’s one specific holding you back, it will become quickly apparent right here. 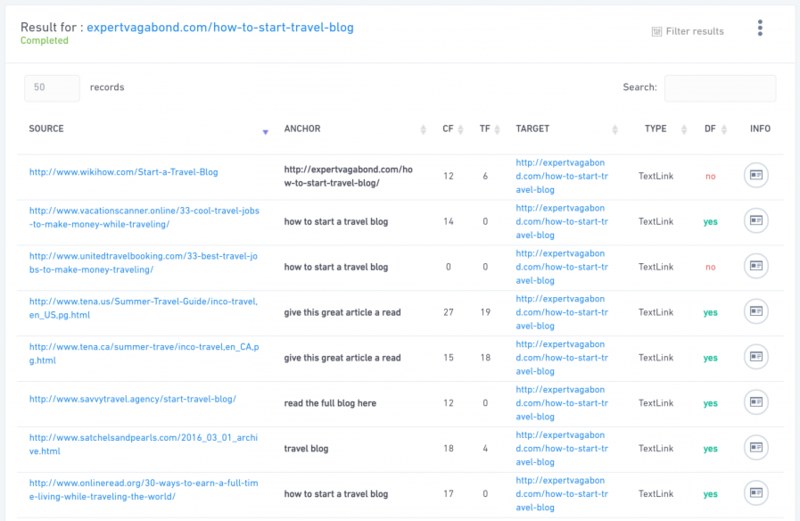 There’s also a breakdown of your important inner-pages of content (like blog posts) so you can track the individual progress of each of those. Great if you have a specific goal in mind for a piece of content. Let’s get into the nitty gritty and explore more about what you can achieve in this dashboard, shall we? Remember all of the following pages are accessible from the dashboard at the top of the page. 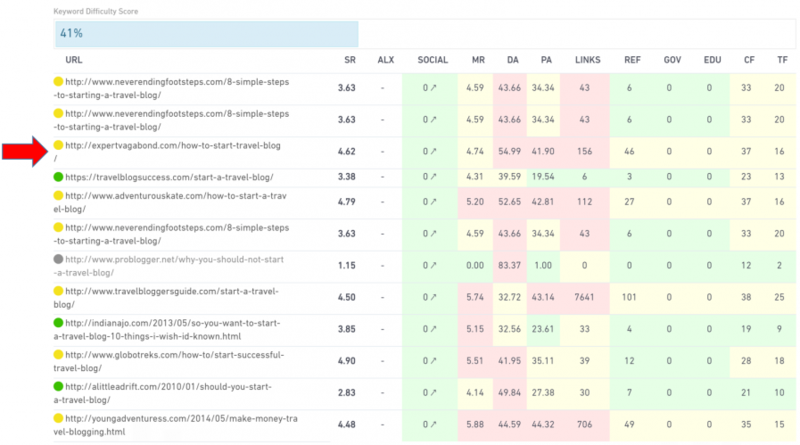 This section shows you a complete breakdown of the important metrics for your site. And you can access information that you’d usually need three or four different tools to access. 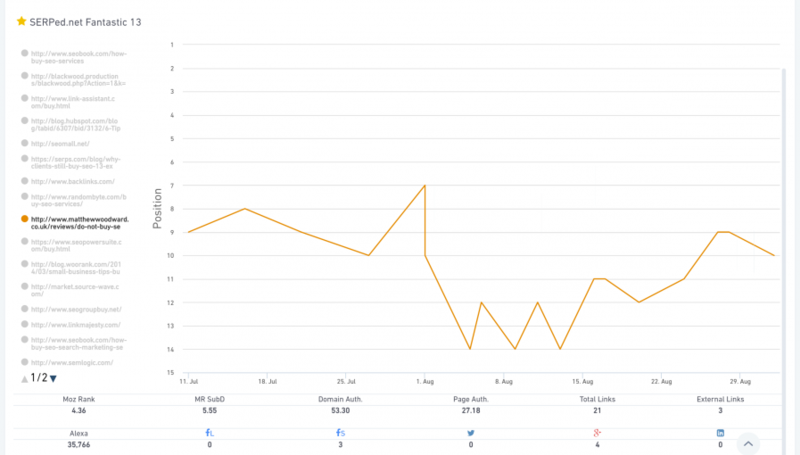 You also receive information about your target keywords, so you can see fluctuations and changes in their search volume too. Allowing you to re-target, or up your game, based on the current situation. This tool is insanely helpful for link building. Especially if you have a pre-existing agreement over that link. 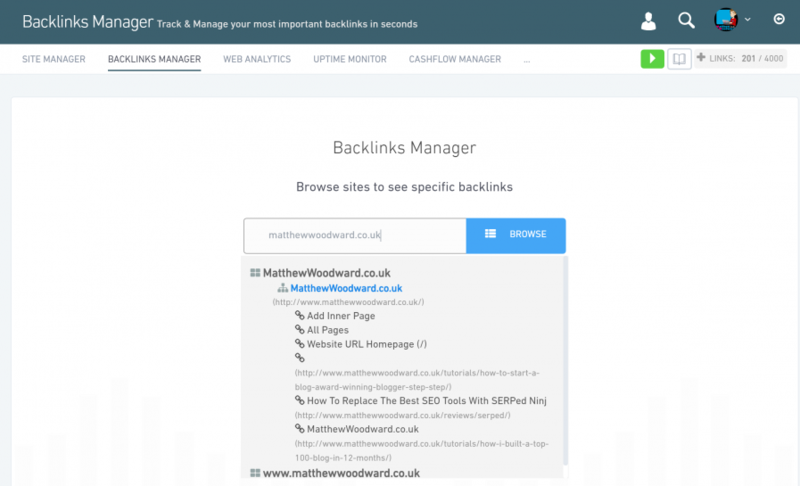 This is where you add all of your most-important backlinks manually and track them. For example, if you’ve paid for a link, or created a guest post in exchange for a link, you can monitor what the site is doing with that link. Or, if that site has been deindexed. This adds a level of control to your link building that other tools just don’t give you. Because without it, you wouldn’t be aware of any of what was happening with your links. The tool will even notify if a link goes offline, so you can rectify the issue at your earliest opportunity. If you’re using a PBN you can also manage the anchor text for your links to avoid penalties for over optimisation, too. You can break this down in any way you like as well. You can focus on links you’re building for a single piece of content (Inner Pages as it’s known on SERPed), too. 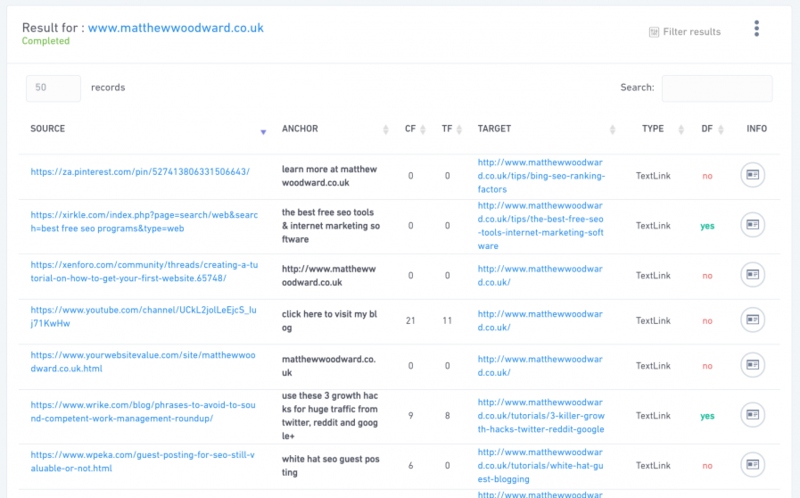 It also gives you a complete breakdown of the quality of your links. 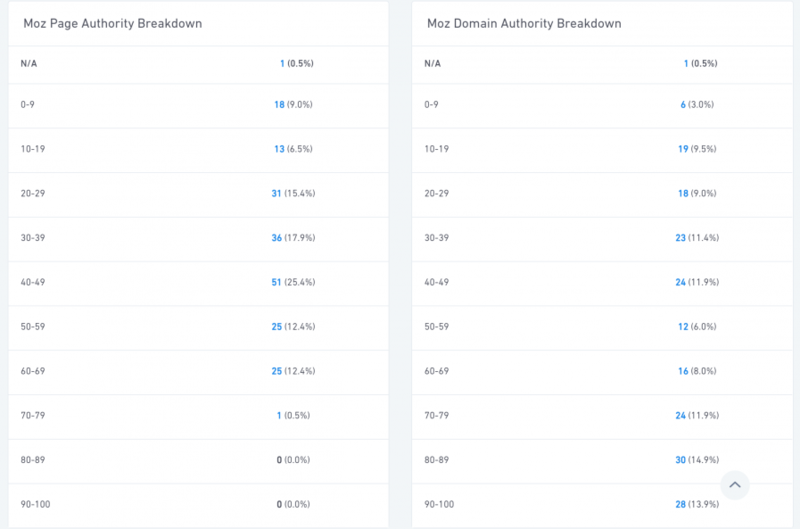 You’re able to view a complete breakdown of the Domain Authority and Page Authority of your links here as well. If you click on any of the blue-highlighted numbers that will take you through to a breakdown of those links. So you can manage them and see why they are where they are. 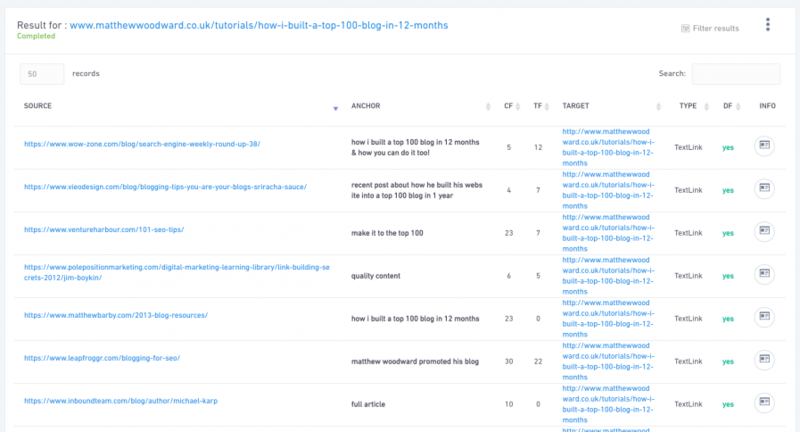 If you’re serious about link building – you are, right? – this is a must have tool that saves you about $300 a month in paying someone else to do it. Which of these situations fits you? If you tick any of those boxes then this tool is one you need to be using. 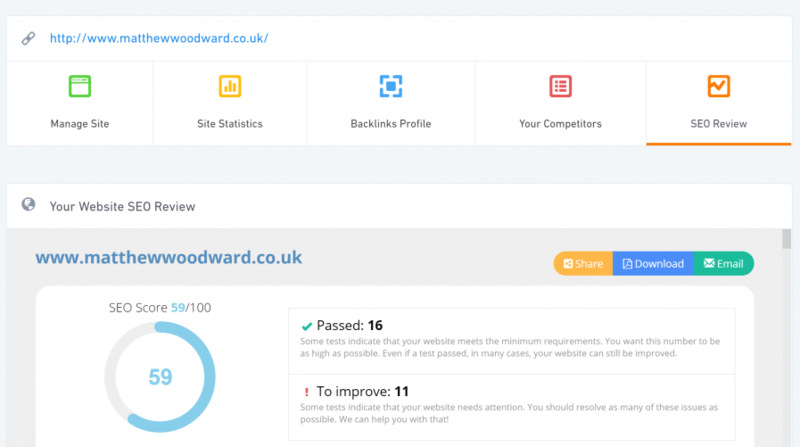 It’s a complete SEO Auditor, that updates as you make changes to your site, so you can see your progress. If you’re working with clients – especially if you’re trying to convert a potential client – you can share this with them to show them how much their SEO needs improving. Making it a much more effective sales tool than the standard, half-assed, pitches you receive on a day to day basis. The results you get are detailed and instantly actionable. If you’re not an SEO by trade, you can use this as a simple check sheet to improve your basic site SEO. Imagine your site kept going offline and you had no idea about it. If, at certain points in the day, you were losing search traffic (and sales) because your page wasn’t there. There’s also the worry that you’re being penalised, ever so slightly, by Google for having a slow site speed. Thankfully, this in-built uptime monitor gives you daily insights into your site. You can track, monitor and improve your sites performance. All while seeing the results in real-time. Making sure your site is always running and optimal efficiency. The SERPed Site Management is the tool you need to manage, monitor and improve your SEO all in one place. Being able to see your results live, and work from that data, is vital. Here are the steps you need to take and the information you’ll gain. Here you can input all of your site settings. Add keywords and tools. And, receive a thorough breakdown of your site’s current situation. Or by clicking the button at the top of the site manager page. 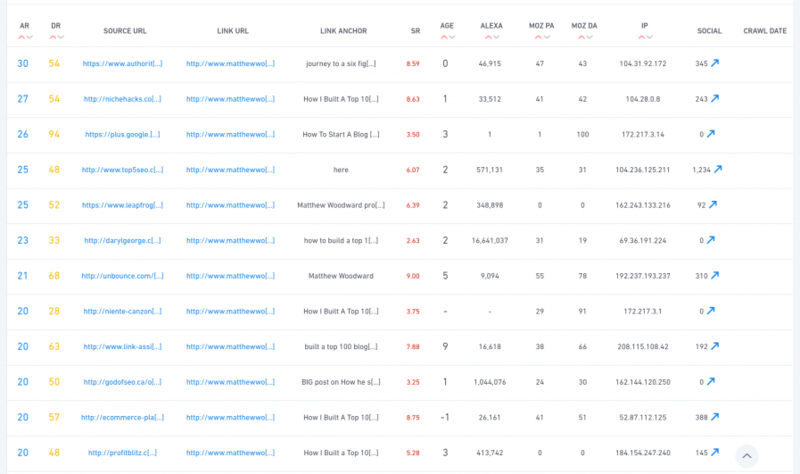 This is where you can add all of your most important, value-adding backlinks and monitor them. If you’ve bought, or exchanged a link, you can see if it’s still online. 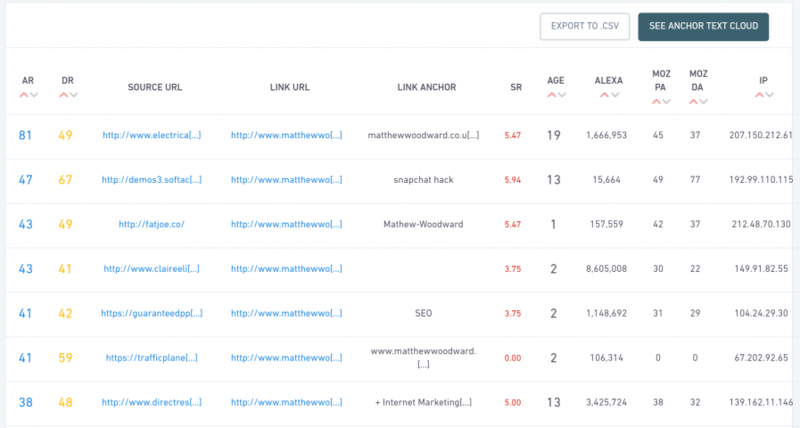 You can also see where you’re losing links to your competitors, for example if someone has Skyscrapered your content, and regain them. 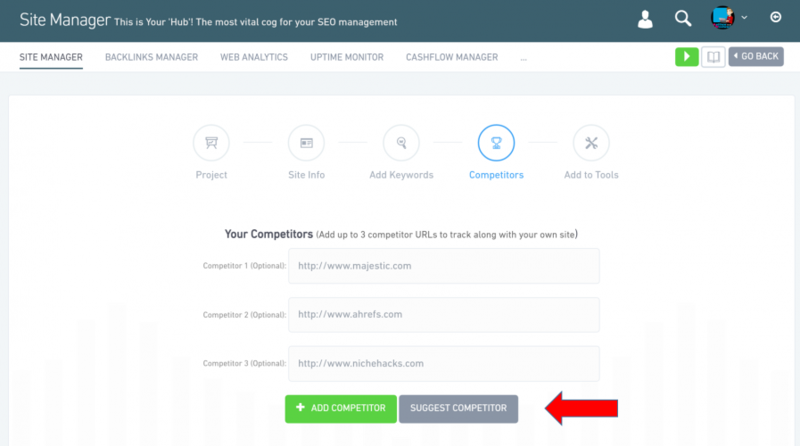 Click the SEO Audit button on the dashboard and receive an insight on your site, and where you need to make instant improvements. Make sure your site speed is where it should be and make sure you’re never dropping offline. Keyword research is arguably the most important part of your SEO. But, it can also be one of the most confusing aspects of the entire SEO process. Is this something people actually search for? What if this is the wrong keyword for my content? Can I even rank for this keyword? 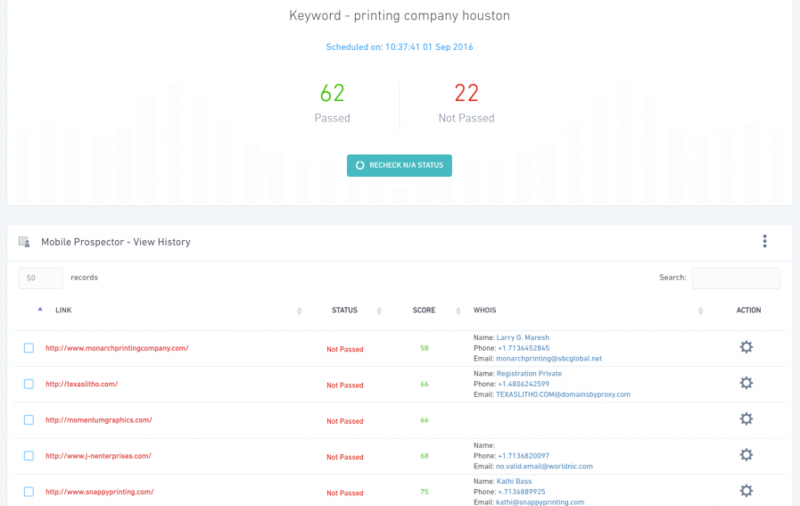 And that’s what the SERPed Keyword Research Platform answers for you. You can dig deeper. Get more data. And, take better action. All in just a few clicks of your mouse. 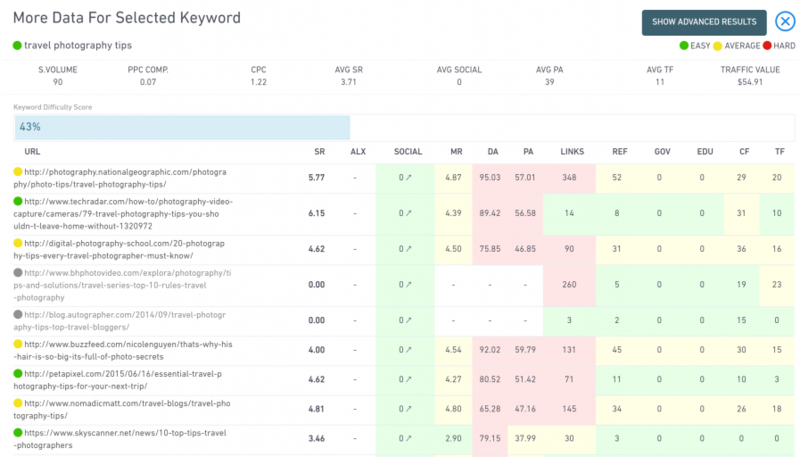 It’s by far the most simple looking keyword research tool ever. But, don’t be fooled. The results are big. Go ahead and enter your information into the search box. I’m going to go for Travel Photography in the United Kingdom. This will take you to a complete list of keywords that are relevant to the keyword heads and tails you’ve chosen. It may produce some results that don’t quite fit your site. But I’ll show you how to deal with that in the next few steps. Okay, I just mentioned the tool may give you some irrelevant results. What search tool doesn’t, right? Well you can use super specific filters to cut through the results and find only the keywords that are right for your content. Change Include for Exclude to get results that omit search volumes. Include > CPC > Greater Than > [Amount] Swap Include for Exclude to get results that omit CPC costs. Swap Include for Exclude to get results that omit specific word amounts. You can collect the data from here and export it to a .CSV file. (Recommended). 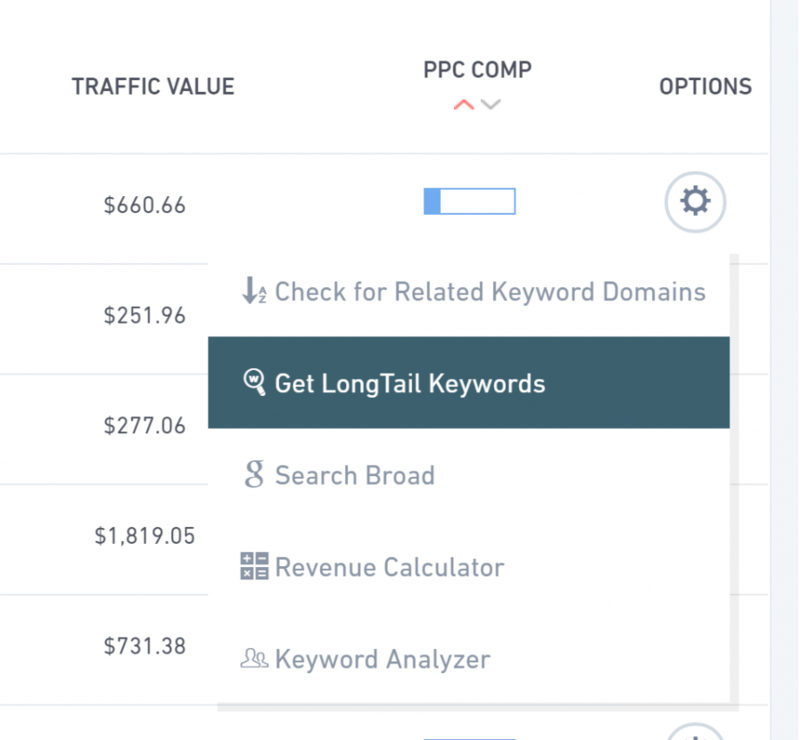 You can drill down to get hundreds of long-tail keywords you can easily rank for. (Also recommended). The first stage is simple. There are three dots above the search results. The next stage is more exciting, don’t worry. That cog at the end of the result is about to become your new best friend. On the next screen select the database you want to drill down through. And then, like magic, you’re given hundreds more long-tail keywords with an epic level of detail. Export this set of results, too. That should already give you a couple of hundred keywords to work with. But, don’t stop just yet, we’re going to go to another level of depth. This is where SERPed begins to stand out even more. Find one more keyword that you like, for example, the one below, and click the Run button at the end of its row. If you start with a broader Keyword, there’s really no limit of how far down you can drill. Find a keyword. Drill down. Use those results to drill down again. And again. And again. Until you have an entire group of focus keywords you can’t not get traffic with. See how on each result there is an Analyze button? Take a second and click it. 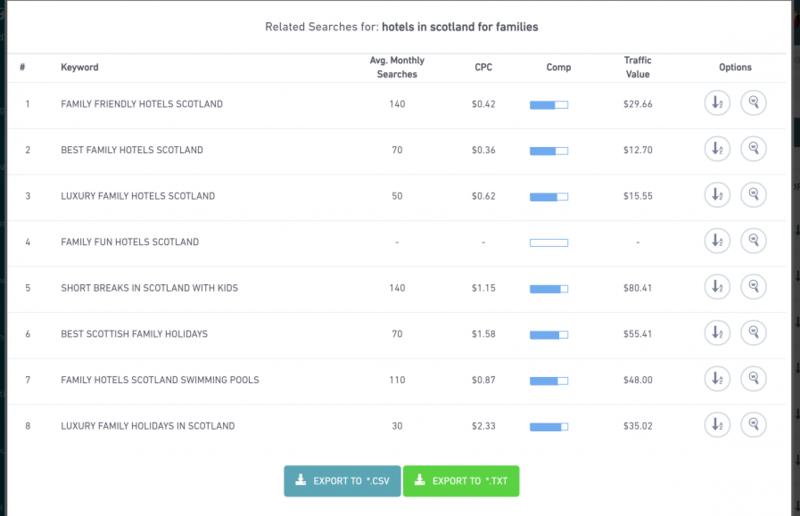 Then you can drill down from those keywords and get even more specific search terms. It’s a never ending resource of solid keywords. Evidently, Travel Photography as a niche is far less tapped into than you’d expect as well. Which is odd considering the volume of travel blogs there are out there. 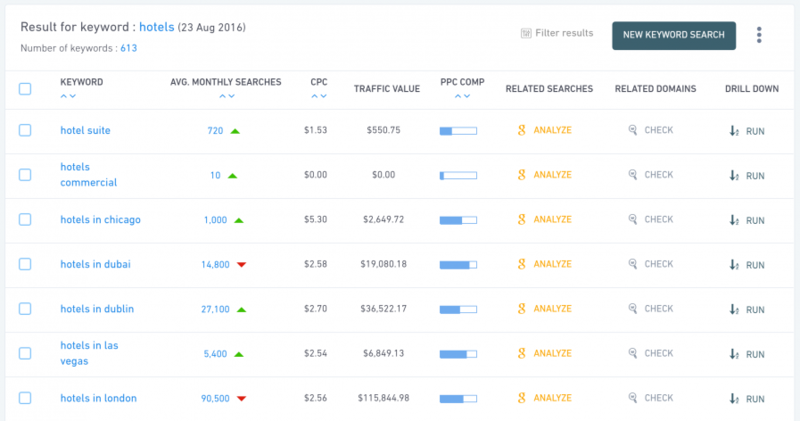 Imagine if you could know exactly how to rank for any keyword. How much better would your results be? Well, with the SERPed Keyword Analyser, you get exactly that. Here you can see the SERP for that keyword, in order, and all of the ranking factors they’re using to maintain that position. This data is insanely useful. Not only because it gives you insight into pages you can steal rankings from – more on that later – you can develop an actionable strategy. For example, check out the number two result from Tech Radar. It’s green, so it’s easy to approach. This information shows you the chinks in the armour of your competitors. So you can attack with extreme precision. You can use this for every keyword you want to rank for. Whether it’s a specific piece of content, or for your entire niche site, the data is actionable instantly. And, by using the site manager from the last section, you can compare it with how far you need to go to get the results you want. What Ranks Where, according to Colin the creator of SERPed, is one of the most underused tools. Which is madness, because you mine some truly valuable data for it. 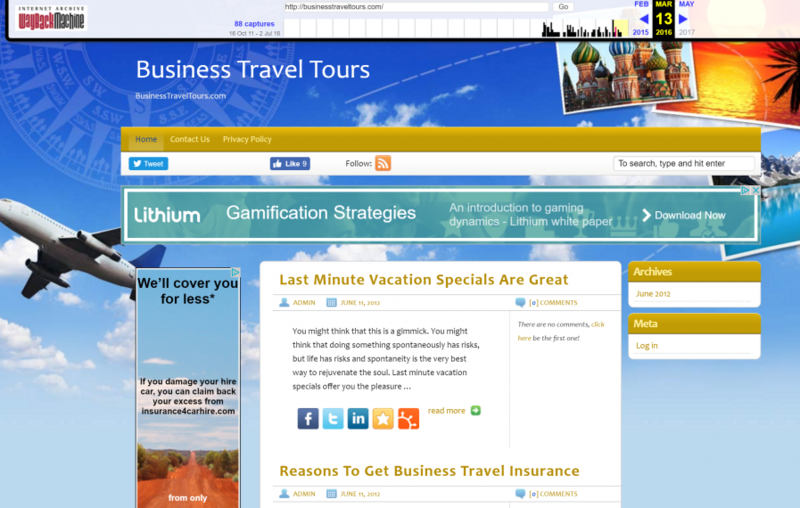 That takes you to a page where you can enter the details for any of your competitor sites. You may already know who this is, or you may be able to find it from the competitor page of the site manager section. This allows you to find which keywords are worth focusing on, or profitable, in your niche. Or what topics you need to be focusing on to generate more search traffic. Okay, he ranks pretty highly for a lot of terms. He’s big game to catch. But let’s look at a step by step guide on how to outrank for this term. This gives you not only the information about how to outrank him but how else you can land on the first page, too. It also shows that ranking for this keyword is definitely possible. Now you can start to build content that will rank. Click through directly to his content to see exactly what he’s written about. And see how great the content is. This shows you the content to beat for the keyword. And, all you have to do now is create content that beats it. The beauty here is that you also have access to all the links that point back to this (and every other site ranking) so you can outreach and steal links back to your new content that’s even better. 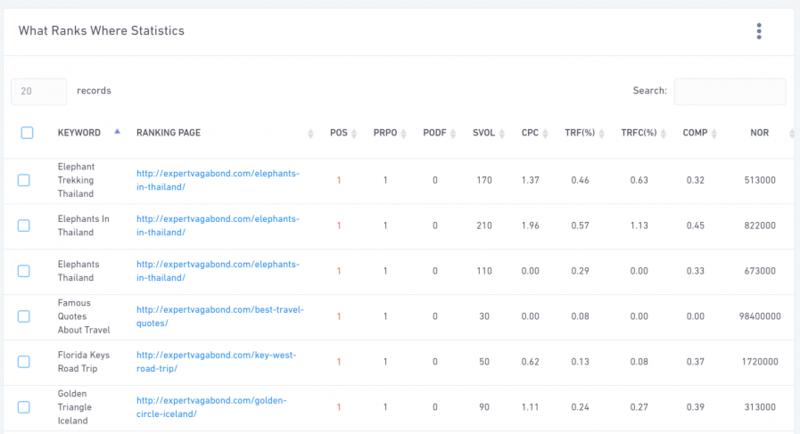 The Keyword Research you can perform with SERPed is some of the most specific and actionable I’ve ever seen. Everything is backed by data to make sure you make informed, fact driven decisions. 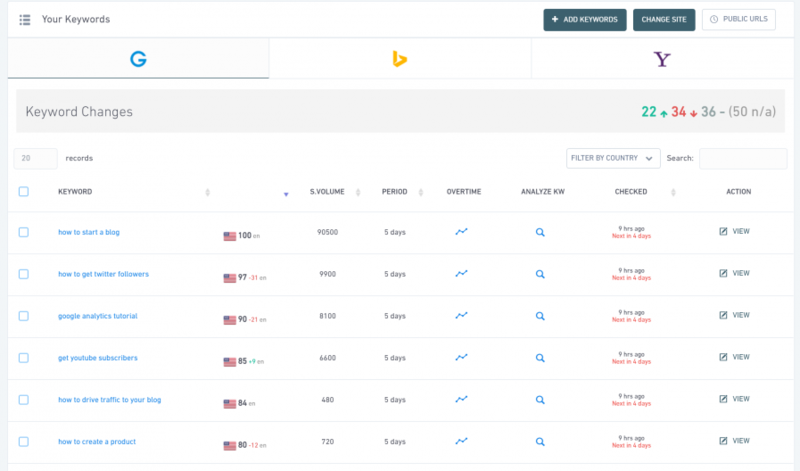 Enter your target keyword, the country you want to rank in, and hit submit. This will give you hundreds of keywords you can start to use in your content. 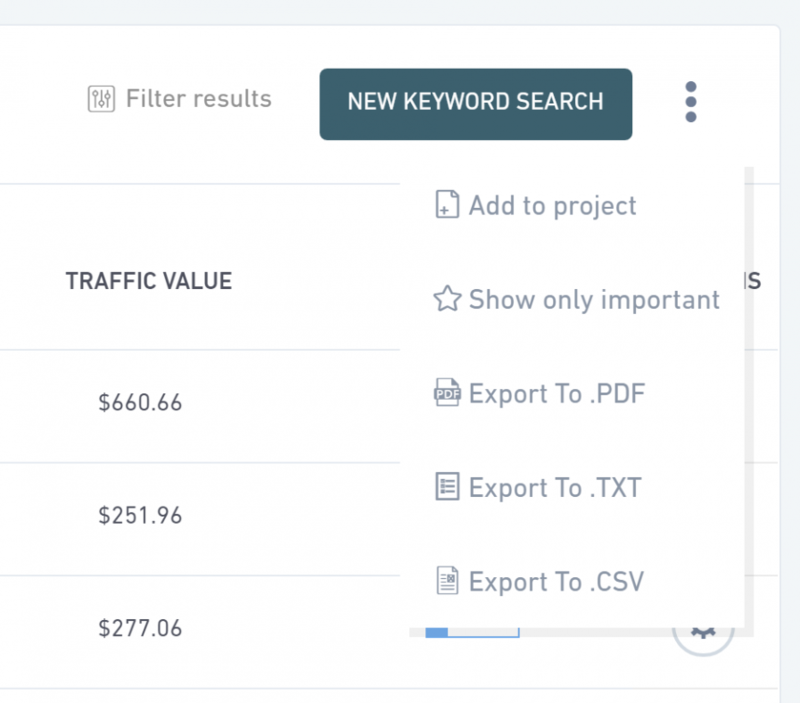 You can then use specific filters to weed out the keywords you don’t want and find your hyper-specific keywords. You can wash, rinse and repeat this as many times as you need to until you find the right keywords for your content. Or, the right keywords to create your content. 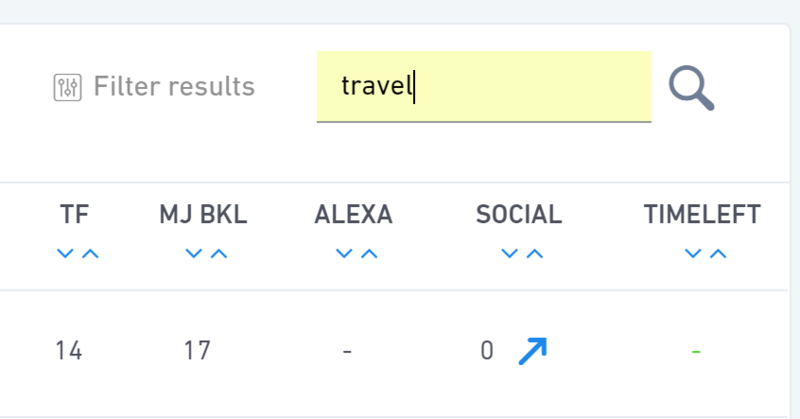 While you’re in the long tail keywords tool, you can click the orange Analyze button, which will show you even more relevant search terms for your keyword. The final took you need to be using is the What Ranks Where Tool. 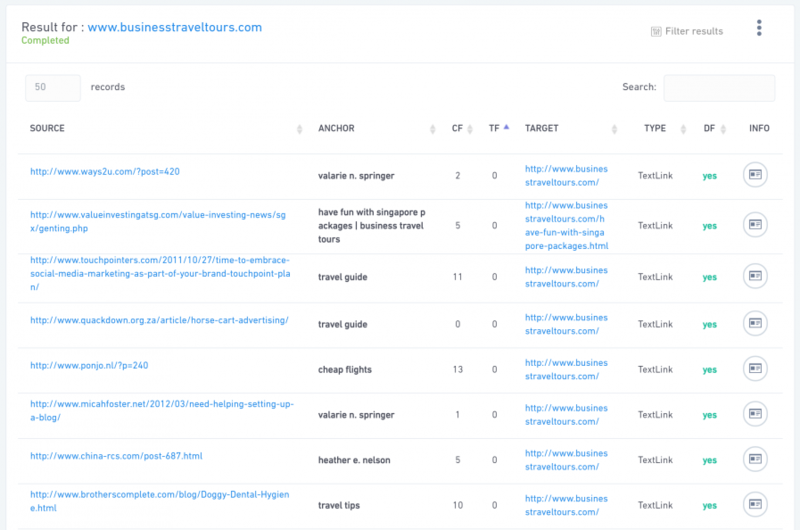 It allows you to see all of your competitors keywords, the links that rank for them. Giving you the data to build a data-driven attack on their rankings, and strategically position yourself on the first page. And, once you have the data, you can use it create Skyscraper Content – or keyword specific content – so not only can you outrank them for keywords, you can use their backlinks to do it. Whether you’re just getting started out in a new niche, add to your Private Blog Network or decide who to target for link building, this is the most advanced tool you’re going to find. 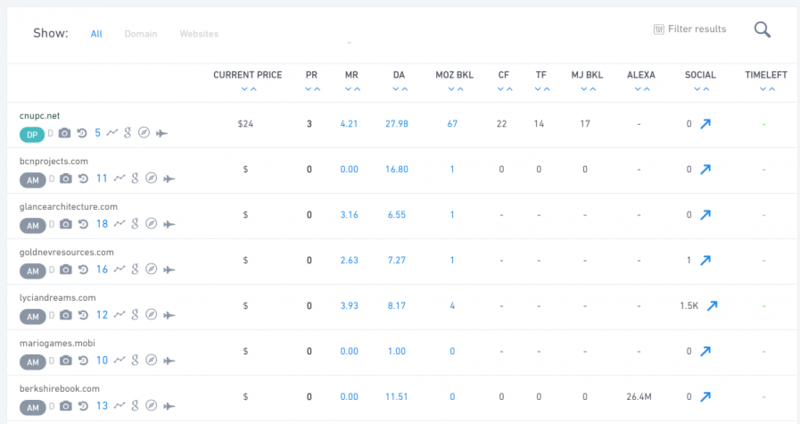 The Domain Analysis tools within S﻿﻿ERPed allows you to make data-driven, informed decisions that you’d pay hundreds (if not thousands) of dollars for elsewhere. In this section I’ll show you exactly how to supercharge your domain research results and build the online presence you deserve. 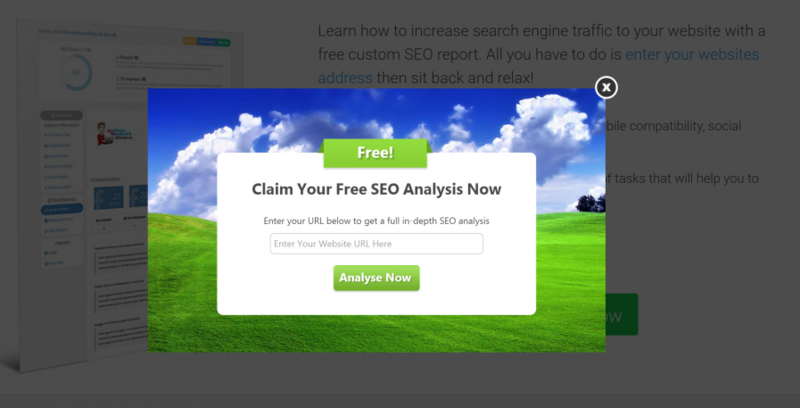 With this tool you’re able to find out whether the site you’ve had your eye on is everything it claims to be. This will give you the full details of every metrics you’ll need to know if a site is legit, or just a nice-looking front. 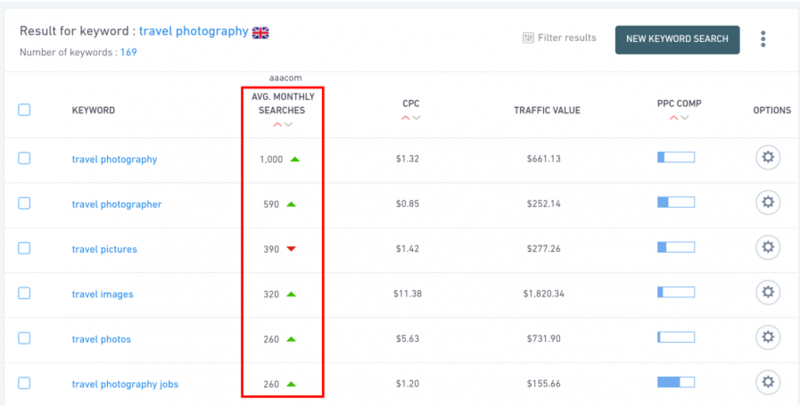 In the report, you’ll see data from all of your major SEO tools. Including Moz, Majestic, Ahrefs and Alexa data, so you can research your domain from every possible angle. That’s one heck of a breakdown. 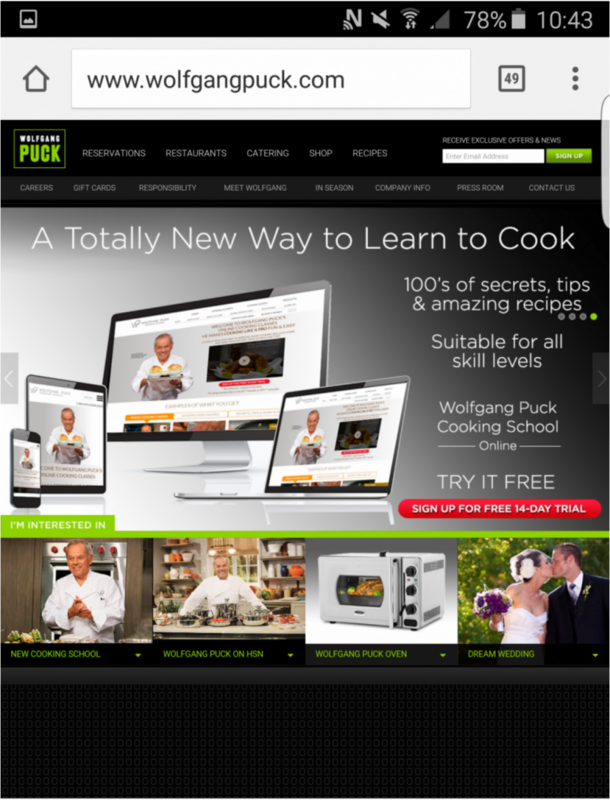 If a domain isn’t worth your time, you’ll know in the space of 30 seconds. And, if you do decide a site is worth your time you’ll be able to explore even further about what part of the site is going to get you your best, chosen results. But, you’ll see more of that in step #25, after I show you the next impressive part of the tool. 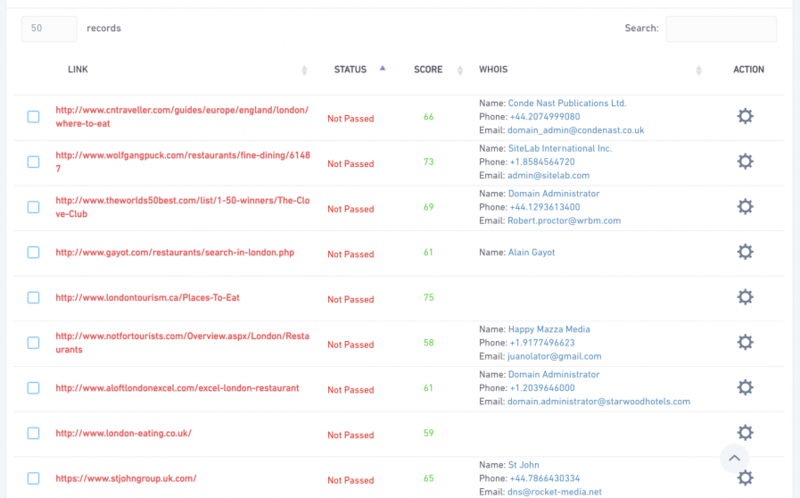 If you’ve got a handful of domains you want to explore, you can analyse them all at once, too. You can check the profiles of up to 20 separate URL’s at once in the bulk analyser tool. And enter all of the domains you want to check out. And, to keep you excited, I’ve checked some of the information about your favourite bloggers. Be sure to add the ‘www.’ at the start of each domain. If you don’t, it won’t process properly. On the next page you’ll get a breakdown of the important metrics for each of your chosen URLs. 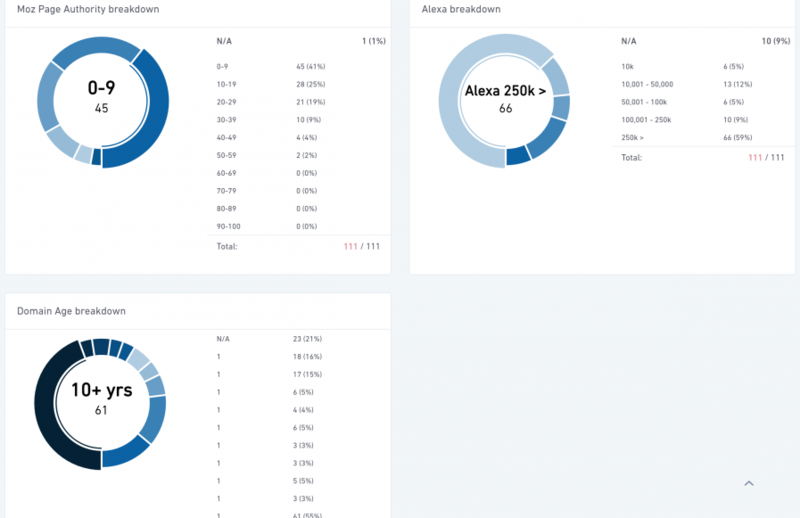 Again, showing you Moz, Majestic, Ahrefs and Alexa data. If you have a specific metric you’re looking for and want to compare the sites against, you can do that as well. At the top of the page select the separate tables view button. This makes the tables look a lot cleaner and easier to manage. Then, choose the metric most important to you from the top bar of the table. Once you find the domains that work for you – let’s say a top five – you can go into deeper detail and take them into the single site explorer right from here. Once you’ve narrowed down to the sites you’re looking for, now it’s time to go deeper. In the next step, I’ll show you how to get stuck into their backlink profile and decide if they’ve got the link juice you’re looking for. Once you’re at the tool you can start to search based on your level of need. If you just quickly see if the site has what you’re looking for. If you want a thorough, complete breakdown of every possible link referring to this site, you can perform a fast backlink check. 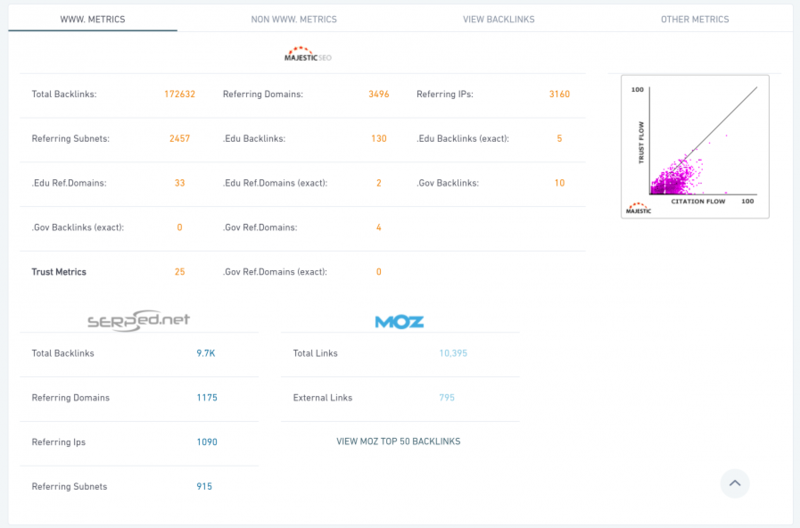 Or, if you want to know every inch of their backlink profile, you can do a deep backlink check. When you’re taken to the page, your default option will be a fast backlink explorer. This shows you the need-to-know backlink information in just a few seconds. This is a wonderfully easy backlink explorer to use. And, you get the exact same quality you would with any paid backlink explorer tool in just a few seconds. If you’re a stickler for data though, this won’t be enough. Which is why you’ll want to head on over to the Deep Backlink Explorer instead. 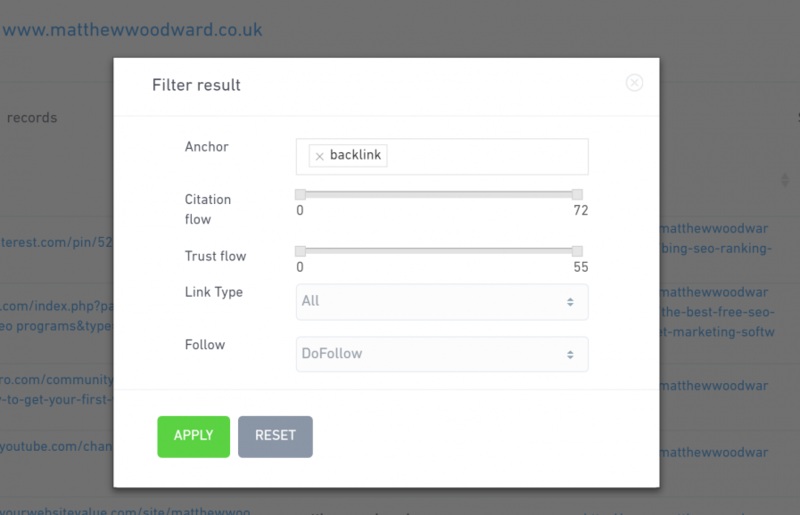 As well as being able to filter out like you can in the fast backlink explorer. On the first page of the tool, select the deep option from the check box at the bottom. Then, in the space underneath, you can choose the specific metrics you’re looking to analyse. Hit the Schedule Domain button and you’ll be told to wait a couple of minutes for a notification. Depending on the size of the site, this time can vary, so go and grab a drink and come back. Or, try one of the other sections in the article. If you don’t get a notification in five minutes, you can follow this process to find out the status of your explorer. Making this a heck of a lot easier to process and determine the quality of their backlink profile. You’ve got so much data here that you can’t help but make an informed decision. And, while it may have taken you a while to read , in action these steps only take a few seconds to implement. Okay, so whichever you choose, this is just how powerful the SERPed backlink analysis is so far. In the next step I’ll show you how to find expired domains to build your PBN, or inject a new site into a niche with some of the legwork already done for you. There are a few tools you can use in SERPed to help you build a PBN or find your new niche site. You’re going to see each of them in the next few steps. This is going to show you all of the expiring domains that rank for your keyword the world over. And show you a breakdown of whether that site is worth your purchase. 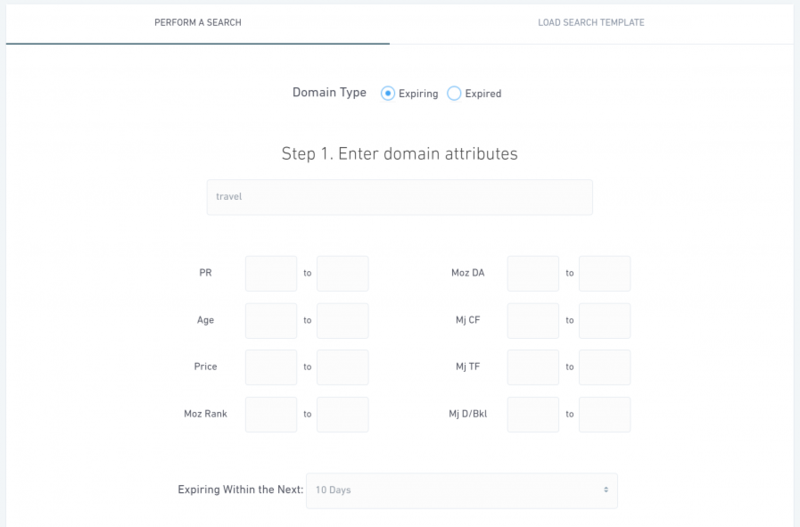 You’ll be given an overview of each domain with information ranging from price and when they expire, to Majestic data and how many referring domains there are. That’s just the tip of the iceberg, too. But you’ll see more on that later. 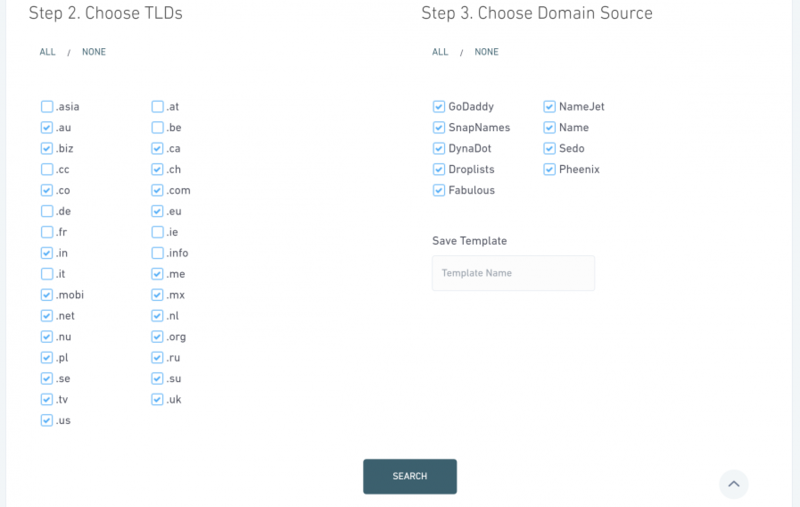 Then, choose where you want the domains to come from and the hosts you’d like them to be hosted with. Once you search you’ll be taken to a huge database of the aged and expiring domains that fit your needs. Not a bad set of results. There are definitely sites you can work with here. Let’s explore one together, shall we? You can really start to get a feel if relaunching this site as part of your PBN (Or as your own niche site) is going to be worthwhile. Which, it just might be. Whoa, that’s a blast from the past, eh? It’s not been updated since 2012 and it has moderate metrics. Someone started well and dropped the ball here. It’s not going to be too hard to use, and update, this domain. But is it as promising as I think it is? Well, running it through the site explorer, it’s a maybe. 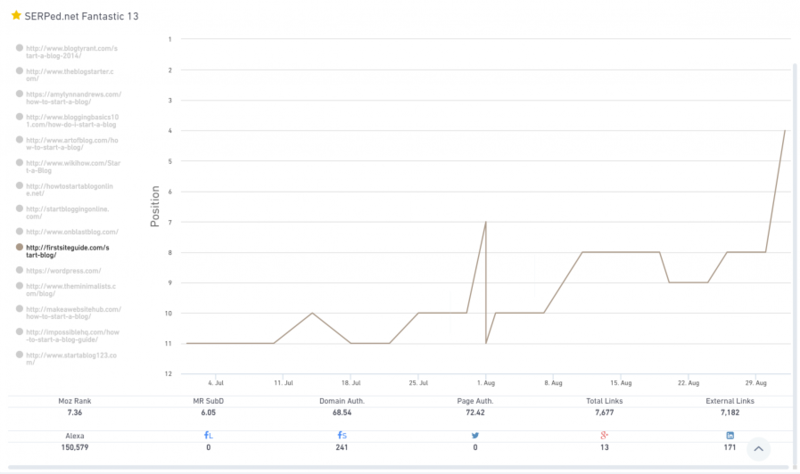 The trust flow is less than 0.50, which can indicate there are some spammy backlinks. But, the domain is old, so you may be able to clear that up with the disavow tool or by writing to webmasters. By diving into the site and looking at some of the links there through the Backlink Explorer tool, it’d be a big task. The site is useable if you clear it up, but the question would be – do you have the time and effort to clear up Doggy Dental Hygiene links that just chuck your name in there? Okay, I’d pass on this site right now. It’s not lived up to the potential I thought it had. But what I’ve tried to show you here is that all the data you can gain through SERPed helps you make better decisions. Instead of it being based on the top-level metrics, you get to see right through to the core of the site. The same steps apply until you find the best domain for what you’re trying to build. Whether that’s this search, or the next one. Got a site that you desperately want a backlink from? Well now is your chance to get it. 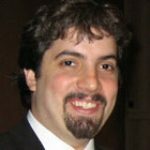 Many of the big sites that rank well have been around for a long time. They’ve got lots of pages. And, in turn, lots of outbound links. You can almost guarantee that they’re not going through their outbound links regularly and checking that the domains are all still active. I know I’m not, are you? Using that knowledge you can snag yourself an awesome domain with links from these sites and add it to your PBN. Or, you know, turn that site into your own niche site straight off the bat. Search the domain and in a couple of minutes it’ll generate your results. You can access them by clicking the Your Search Domain History button above the search bar. Choose the results of your domain search, and you’ll get all of the available domains with links back from the site you’re looking for. Jackpot. While you can do a deep search of the site, you don’t need to. See the info button on the right hand side of the results? Go ahead and click on that. You can decide straight away if this is a link you can get juice from, or if it’s useless to you, like a blog comment. This link is to a site called But Mitre. It’s do-follow, and it’s .com, which for me is a bonus. Let’s take a look at the content then. 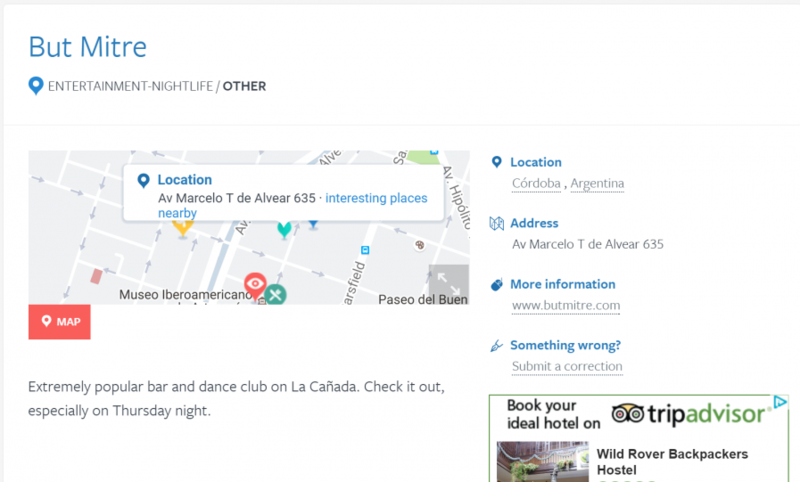 You could straight away buy this site, turn it into a page about clubs in Argentina (or South America) and use it as a platform to link back to your site. Passing on that love back to you. (Heck, you could even adsense it). You could create a write up of this club for your site – especially if it’s open – and see if they’ll link back to you on your site. You could even find a Trip Advisor review to skyscraper. 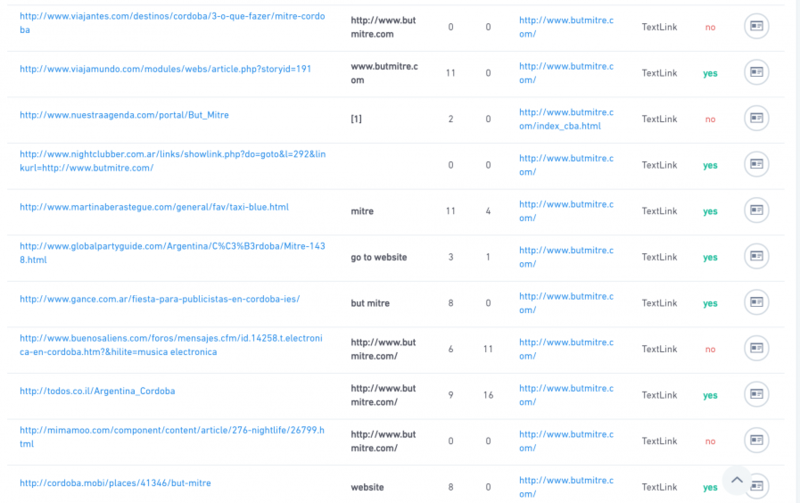 Or, you can run this through the Backlinks Explorer and see who else is linking back to that site. Then, let them know the page is no longer in use, but you have better content they can link back to. Just because it doesn’t come up with the perfect result each time doesn’t mean there isn’t something to work with. With SERPed it’s easy to dig, dig and dig some more to find how you can turn it into a win. Not only does SERPed combine your SEO tools; it combines your domain tools like Flippa, After Market, Digital Point and Free Market as well. Meaning you can analyse and purchase the top domains for your niche all in one place. The first list is non-specific. So, if nothing jumps out at you, don’t fret. You can start to narrow it down. That will bring up every domain and website that’s available for that keyword, too. 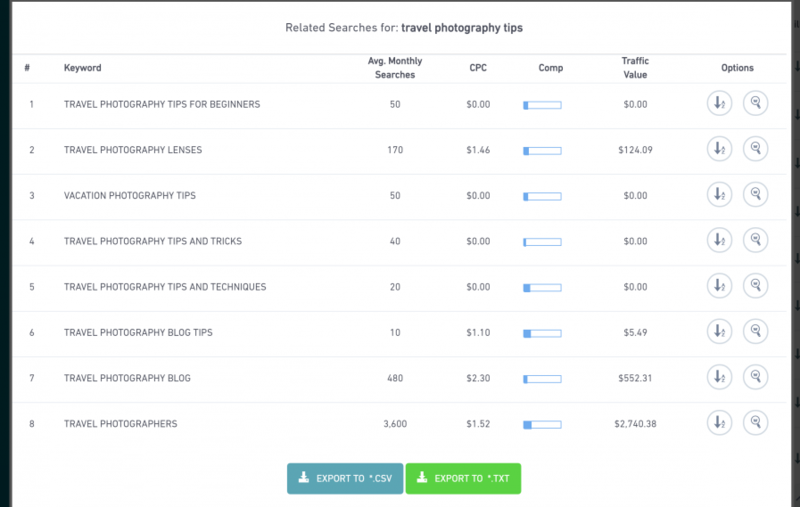 Which is a heck of a lot of usable results; maybe I should have been a travel blogger after all, eh? Want to know if that site (or domain) you want to add to your arsenal is worth it? This is the tool for you. And enter in the URL of the domain you want to analyse. Here you’ll get a full breakdown of the sites metrics and whether it’s a worthy purchase. Got your eye on multiple sites? Don’t worry, you can get the same results for multiple domains at once. 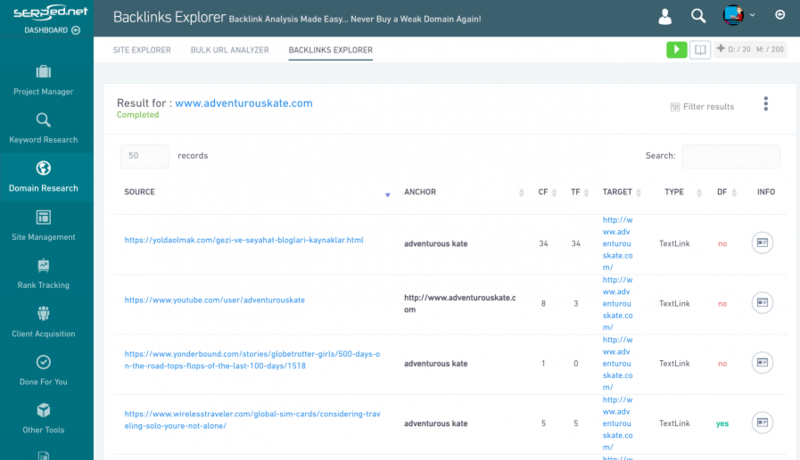 The Backlinks Explorer in SERPed is impeccable. You really can get more actionable data than on a lot of other tools I’ve used. And enter the site you want to explore the backlinks of. You can either choose to do a Fast or Deep exploration of their backlinks. If you choose the Fast option you’ll get to see an overview of the links pointing back to that domain, the anchor text cloud and if a link is do or no follow. If you go for the deep option, while it takes a few minutes longer, you get much more expansive set of results. 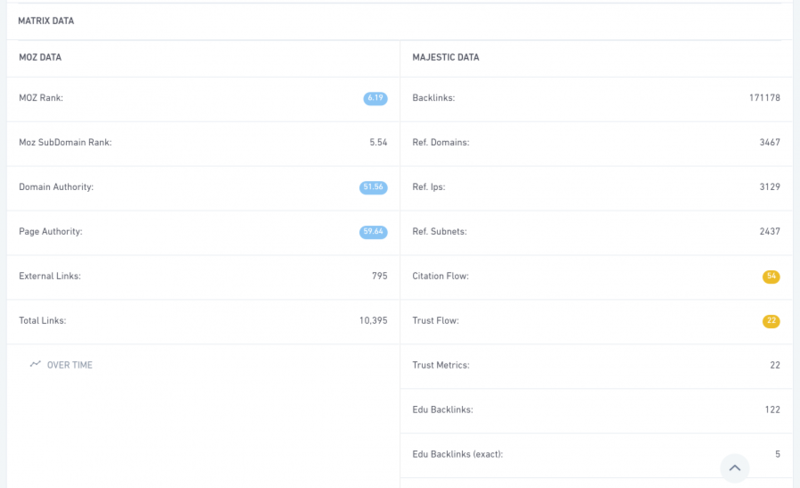 You’ll be able to check domain ages, Moz data, Alexa rank and a much more comprehensive anchor text cloud. That’s before you even begin to look at every possible backlink pointing to the page. Always be ahead of the game in finding expiring domains, with done-for-you statistics, coming up for grabs. You can easily find backlinks from your must-have sites so you can spread some of the link juice for yourself. Not a bad deal, right? And it’ll show you all of the top expiring (or expired) domains in your nice. You can just filter by what you’re looking for, and you’ve got access to hundreds of domains you can by then and there. You can even access important tools from this dashboard – like the site explorer – so you can get a thorough look at the site before you buy. Alternatively, if you have a more specific need – like a backlink from an authority site – you can use the expired scraper to find a site with a link from that site. You can access every piece of information about the link from this one dashboard so you can make a data driven decision on whether a purchase is worth your time. If you want to build your empire from buying done-for-you sites, you’re in luck. 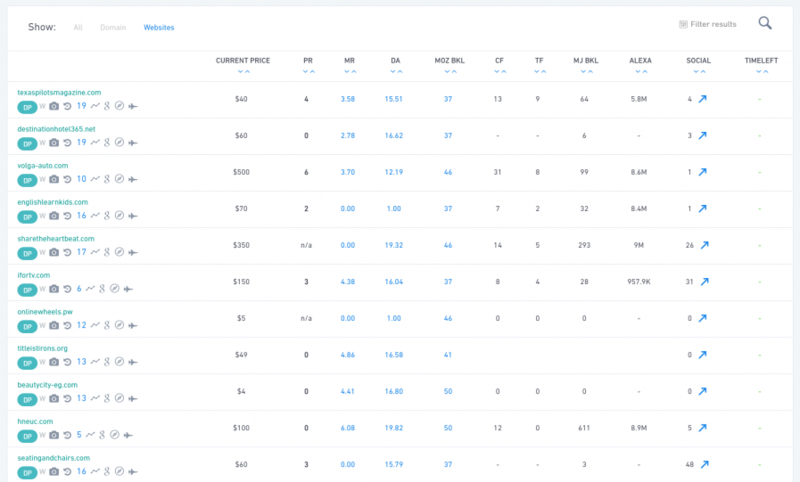 You can access all auction sites from the Auction Master tool and purchase from your dashboard. 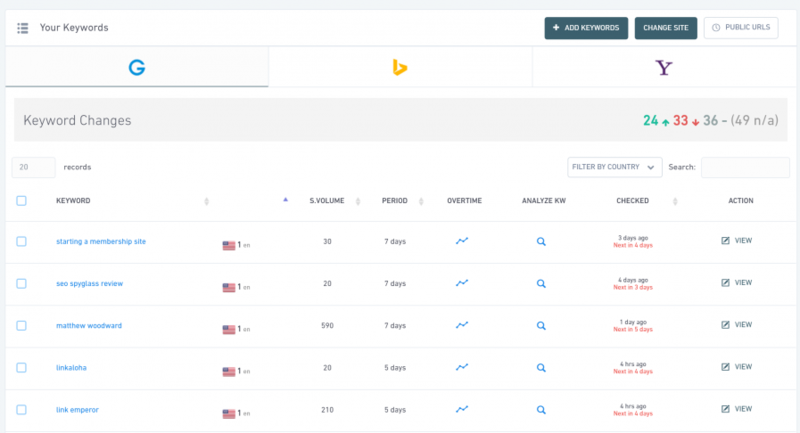 Imagine you could know exactly where you rank in Google, Bing, Yahoo and YouTube, anywhere in the world, at the push of a button. Well, once again, that’s what SERPed allows you to do. 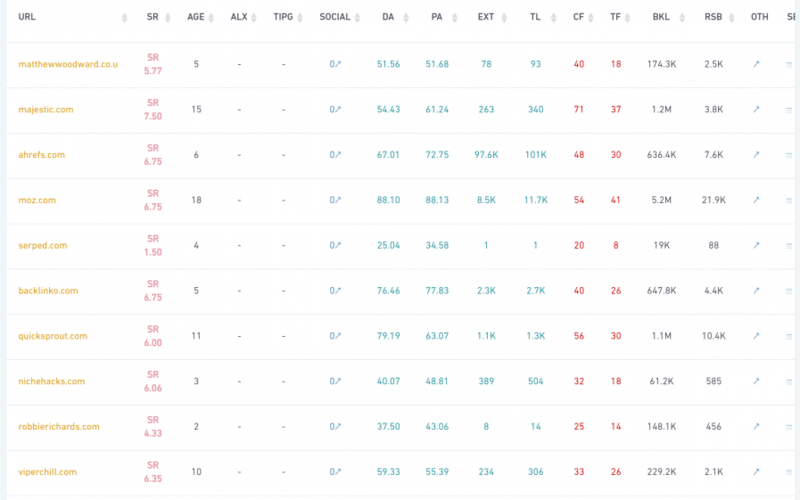 Whether you’re doing in-the-trenches local SEO, or trying to get your blog to rank globally, you can pinpoint your exact movements to see what’s boosting your rankings. Or, to show your clients the ROI of your work. 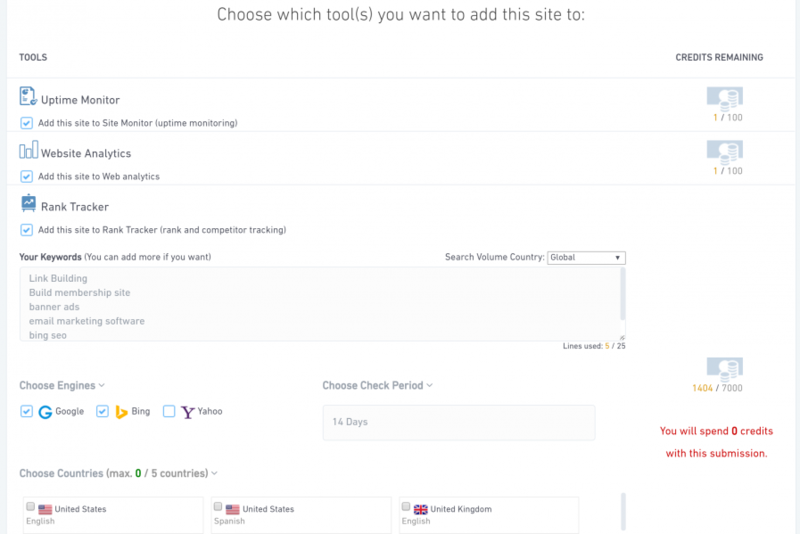 If you’ve already set your site up in Site Manager head over to the Global Rankings tool. This will show you your results for every country you want to rank for. You can have a quick scan of this page if you want. It’ll show you some metrics about your rankings. But for now I’m going to hurry you through a little. That will show you your site URL, a couple of metrics and the Keywords you’re currently tracking or ranking for. 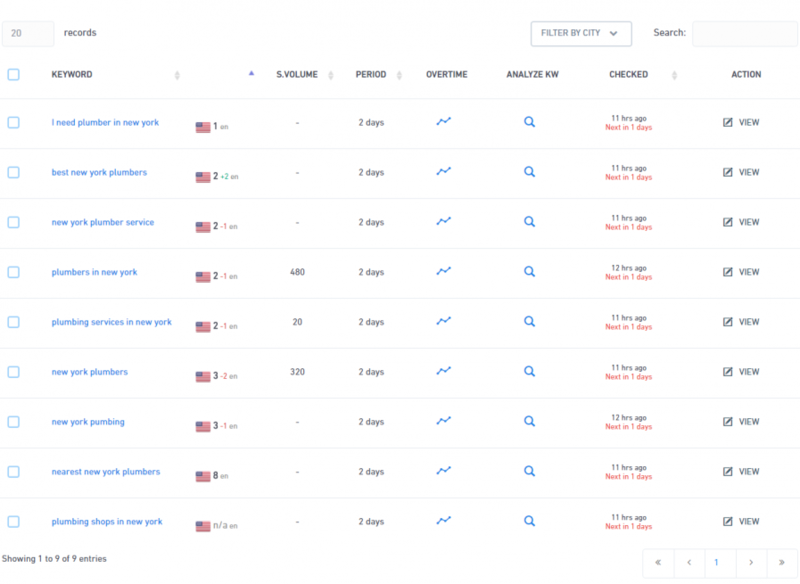 Now you’ve got a complete list of every keyword you rank for. And, where you rank for it. If it shows N/A it means you rank outside the top 100. You can update this to show you results from Bing and Yahoo, also. I’m currently 100th in the world for that. And, if I click on my Over Time statistics, you can see that I’ve plummeted in those rankings recently. On the keyword screen select the View button and you’ll be taken to this page that shows you the data for this keyword. Scroll to the bottom and you’ll see a list of the SERPed.net magic 13. 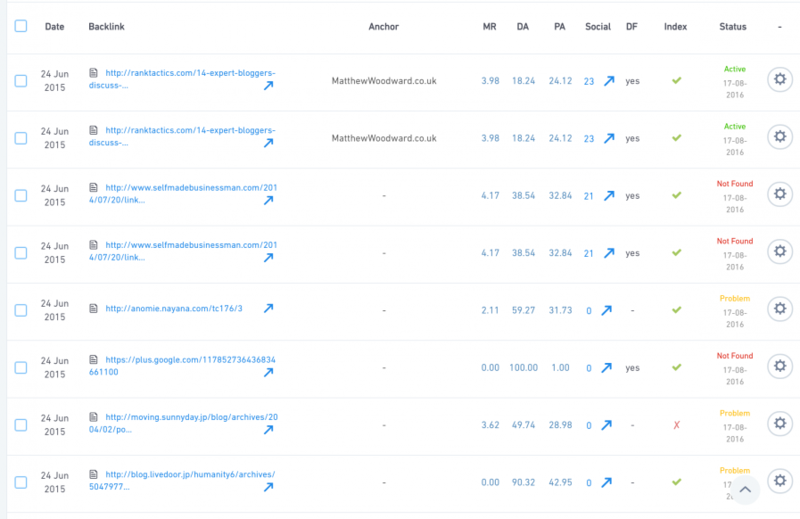 These are the top 13 people ranking for that keyword. But, you can see all of their metrics on why they rank there. From the bottom of the page you can see they’ve been focusing on getting a huge number of links back to that one page. As well as focusing on targeted social metrics – Linkedin and Facebook shares. You can also send this to the keyword analyser that you saw before to find out the weak points of each position. Now you can track your results real time. 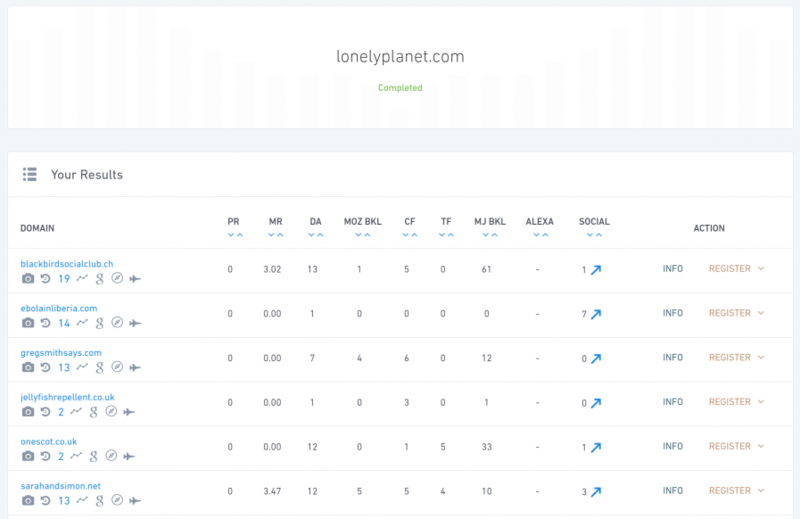 Stay ahead of the competitions tactics and boost your position based on data. Win/win/win. 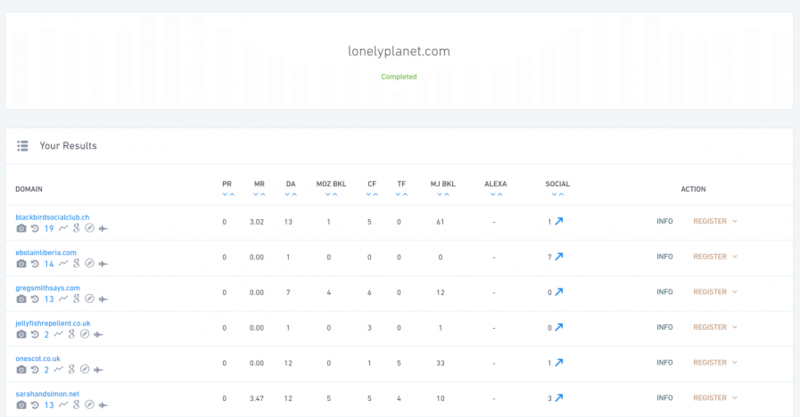 You’ll be able to see where you rank for local SEO keywords, and take all the data you need to start ranking for any city in the world. There’s not much to it, either. In just a few clicks you can have a ton of data to start mounting a tactical campaign. Set up your site, and your target keywords, in site manager. If you’re unsure on your keywords, follow the steps in the keyword research section and then come back. Once you identify a keyword you want to improve upon, click on the View button at the end of the bar. That will take you to a page stuffed with information about that keyword. And, most important, data on who is ranking for that keyword and some insight as to why. All that’s left to do is mount your charge for the top 10. See you there! SERPed was cooked up by SEOs, for SEOs. And who knows your needs for getting customers better than that? The Client Aquisition part of this tool focuses on helping you win and close clients so you can grow your income, even if you’re starting from scratch. If coffee’s for closers, you should probably go and start brewing a pot. Being able to prove to a potential client they need SEO is an absolute game changer. And, with the Site Auditor Pro tool, you’re able to generate stellar reports that can convince and convert. Imagine people coming to your site and they leave firm in the knowledge they need SEO from you. And, to top it off, they’re now part of your mailing list. That’s the experience you get right here. In fact, I’ve been using this for my SEO Agency for the last 18 months, and the results are next level. Enter their name as the name of the project and add it. I’d suggest the name of your agency. Then you can choose how you want your reports to look. If you’ve already added branding when you’ve set up your account, select it from the drop-down menu. Or, if you’ve not done that yet, click the Create New Profile button. Reports can be generated in English, Mandarin, Portuguese, Dutch, Spanish, French, German and Italian. Giving you the option to target people the world over. You can leave these as default, or toy around and see what works for you. They’re not the most essential part of this tool, so see if you get good results from one or another. The report will come with it’s own set of action-tasks that will push clients towards you. But, should you feel the need to, you can add your own. Again this is a done for you summary. But, if you give two craps about your brand image, you should update this to your own summary message. This is their final call to action, so to speak. 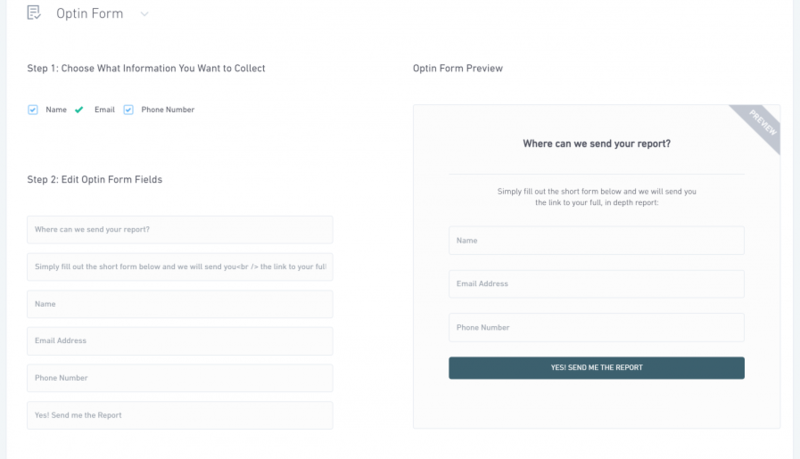 Nows your chance to create a custom opt-in form that will appear on your site. It’s completely customisable, so you can play to your hearts content. You’re going to need to skip a step here. Ignore the Embed Codes tab for now, and head to the 3rd Party Integration tab. 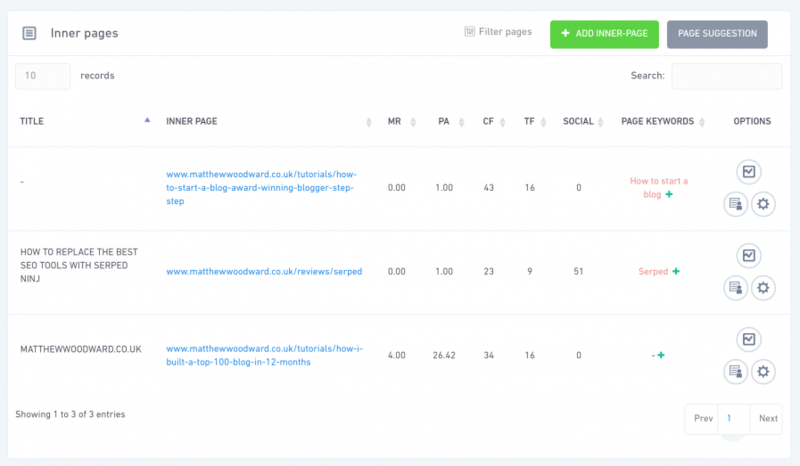 These can now be added to your landing pages, or SEO Report pages. And trust me when I tell you, this tool converts like CRAZY! Over the past couple of years this tool alone has added 6 figures to my agencies annual revenue. I highly suggest you take advantage of it too. This tool is guaranteed to get you clients. 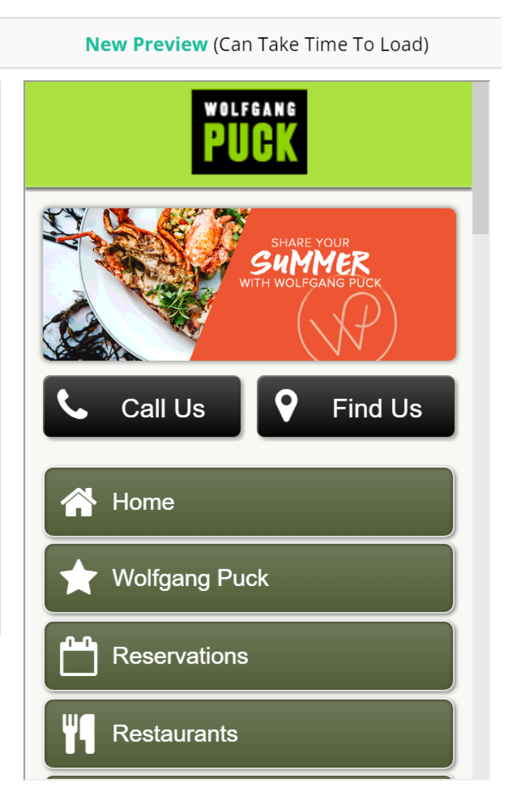 You’d be amazed at how many businesses don’t have mobile friendly sites. But this is about to become your biggest opportunity yet. Because this tool will show you all the mobile un-friendly sites competing for a particular keyword. And you can reach out to them and convert them into your paying client. Yeah, it’s that simple. Look at all these sites that need your help to boost their rankings. Now strap yourself in for the best part of this tool yet. 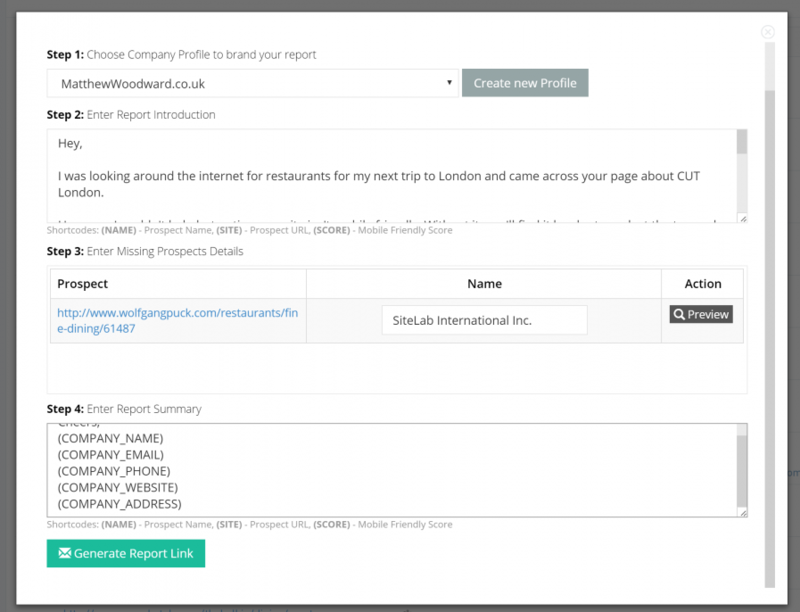 Choose a site that you want to contact and you can send them a report directly from the SERPed too. 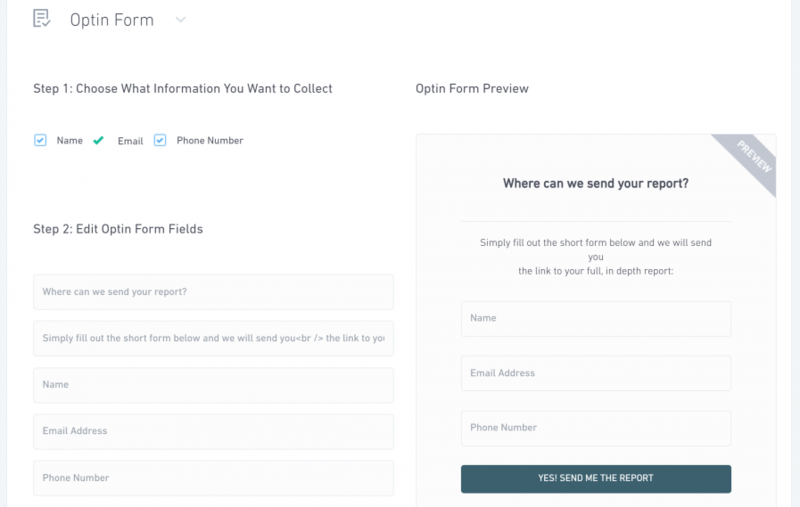 That will bring you to a page where you can create a custom email report to send. 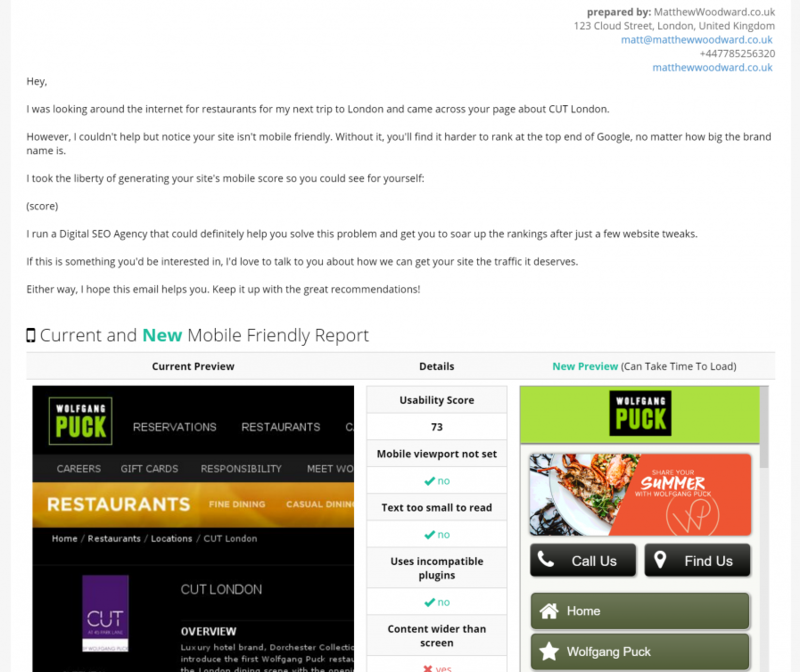 For less than two minutes work you can generate an excellent report that’s ready to attract clients. Your potential customers can’t help but see the value here. And, you don’t have to spend hours creating individual pitches and hitting and hoping. If you can’t use these two tools to get new clients, I don’t know what will help you. 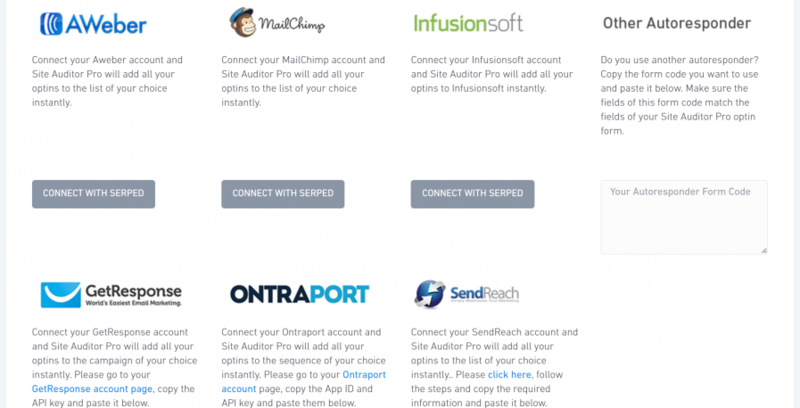 Get SEO Clients easier than ever with these tools from SERPed. These tools allows you to get right to the heart of the problem and boost your conversion rates with little to no effort from your site. I’ve personally used this one-two punch of tools to grow my income SEO Agency and I’ve never looked back. 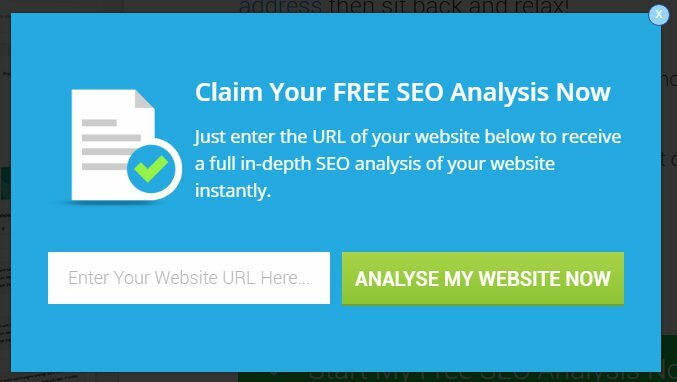 When people come to your site you can provide them with a free SEO Audit that will convince them of how much they need SEO. And, turn away customers who would be a waste of your time. You’re also able to inject these people directly into your mailing list, so even if this first contact doesn’t make the sale, you have plenty of opportunity to do so in the future. Set up your project. 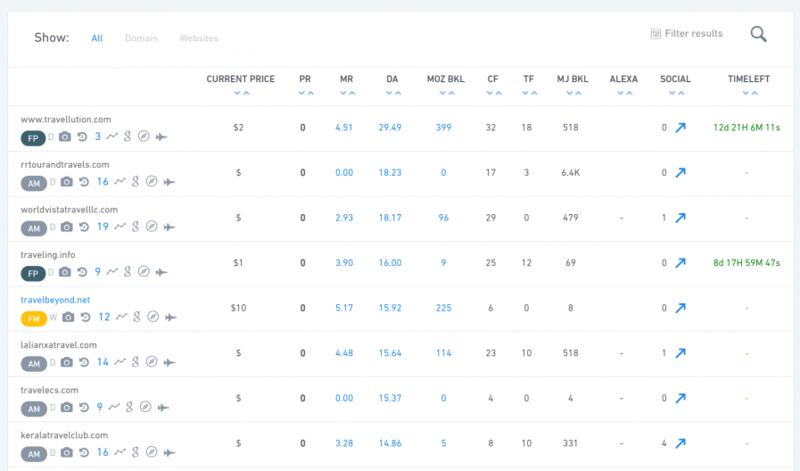 Then you’ll be able to custom create an entire sales tool from right inside this dashboard. You can select custom designs, add your own copywriting and select your autoresponder so everything runs smoothly. Take the code, add it to your site, and presto you have an awesome sales funnel to help you generate SEO client after SEO client. Mobile is essential in today’s SEO. We both know it. But, somehow, there are people out there who have no idea about it. This tool lets you turn those people into clients. Pick a keyword – one that generates a lot of traffic – and you’ll be presented with a whole list of sites that aren’t mobile friendly and want to rank for that keyword. You don’t need to leave the browser to take action, either. Click the cog at the end of the result and you can generate a report you can email directly to the Webmaster right now. Do this to everyone on the list and that’s 22 brand new leads from this one search. Repeat that a few times and you’ll be knee deep in new clients. 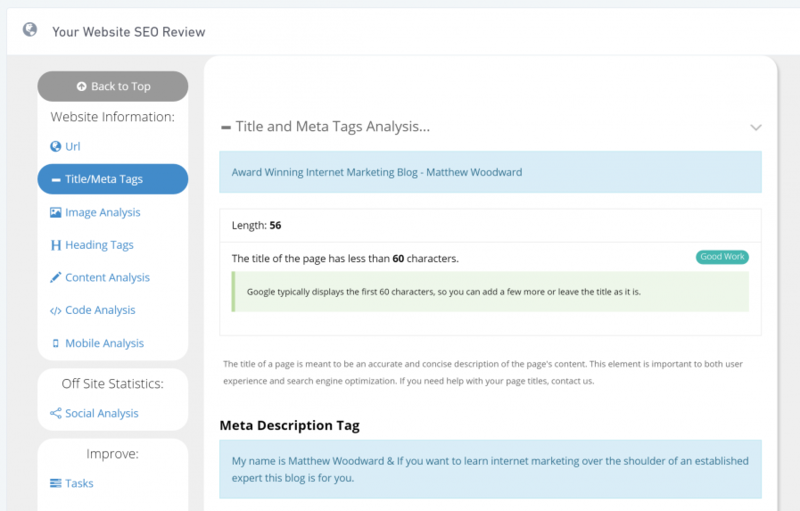 These last few tools are here to help you level up SEO even more and give you supercharged results. 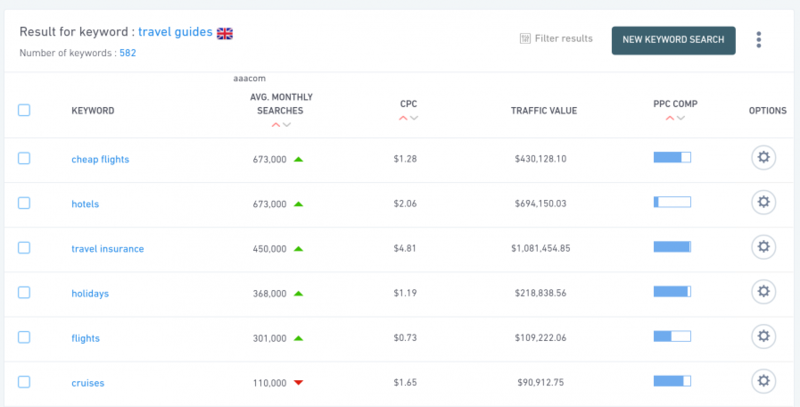 From getting free social exposure, to seeing your map rankings and letting you audit any site from in your browser – you won’t want to miss them. 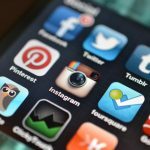 The Social Exchanger is a tool that allows you to boost your social signals by getting other users of SERPed to share your articles for absolutely free. 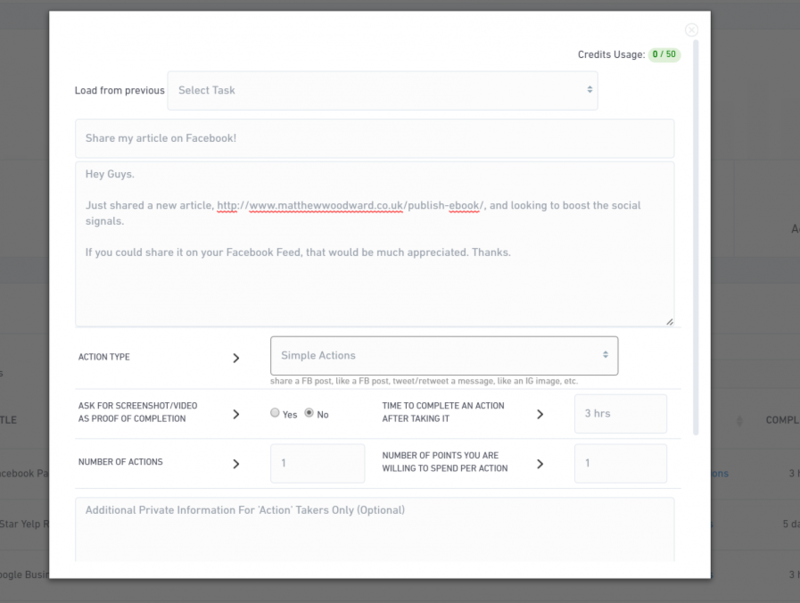 Once in, click the Create New Task button and you can ask people to take any action on your content. From likes, comments, shares and retweets. There’s really no boundary. Submit it, and you’re all done. There’s a whole list of actions you can take for other SERPed users too. So, remember, the more you give, the more you get. This tool is still in BETA but it’s getting ready to launch. But, let me tell you, the insights are brilliant. You can track your progress in ranking inside the top 20 listings. This is forward thinking and has come at the request of lots of SERPed users (myself included). And, when it goes fully live, you’ll be able to derive unreal data. This tool is supposed to be under wraps. But, they’ve given me exclusive rights to tell you all about it. The SERPed Plus Plugin isn’t just another SEO plugin that shows you metrics like SEOQuake or MozBar. If you’re on a site that you like the look of, you can enter in the details and get instant data without leaving the page. This add-on is only for Ultimate Members. But, watch this space, because I’ll update if it becomes available to all. $79 per month for premium or $179 per month for ultimate. With the launch of the 2.0 software there’s talk of the prices going up, but if you act now, you can lock in these prices for your membership. And, it’s still much cheaper year on year than buying each of the tools you can work with here separately. SERPed is currently closed for new members. HOWEVER I have arranged an exclusive back door for my readers which you can access here. There is no free trial available, however there is a 30 day no questions asked money back guarantee. If you are not happy for any reason just open a support ticket and you’ll be refunded in full. How Many Countries, Languages And Databases Does It Support? 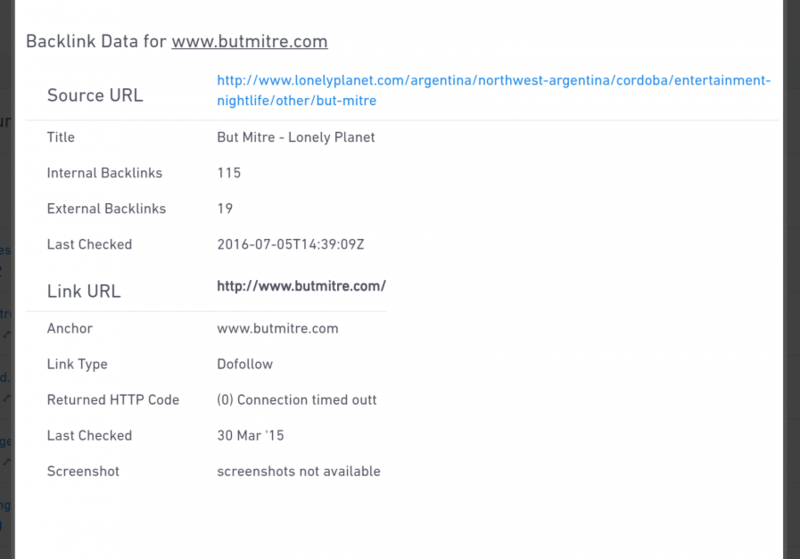 You can get data for any country that is currently being indexed by Google or Bing. And, in their native language. That means it is great for international SEO, no matter which country you are targeting. Yes. But, it’s kept under wraps. You’ll have to send a ticket to SERPed directly to find out more. Phew! Okay, there you have it. 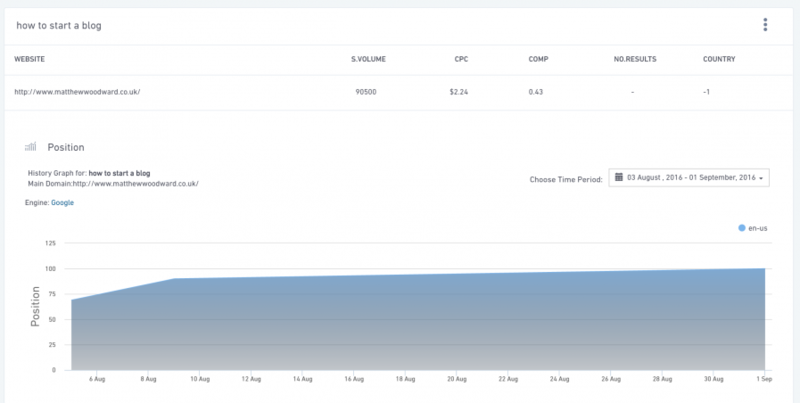 37 ways to use SERPed to supercharge your SEO and traffic. Here’re the links back to every individual section so you can go back and take on the next challenge with ease. What are your favourite parts of this tool? What else would you like to know more about?